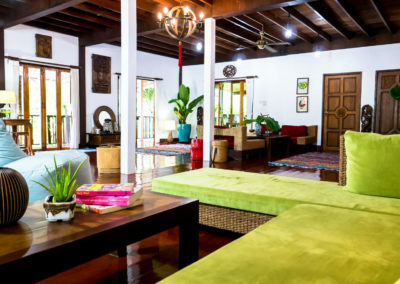 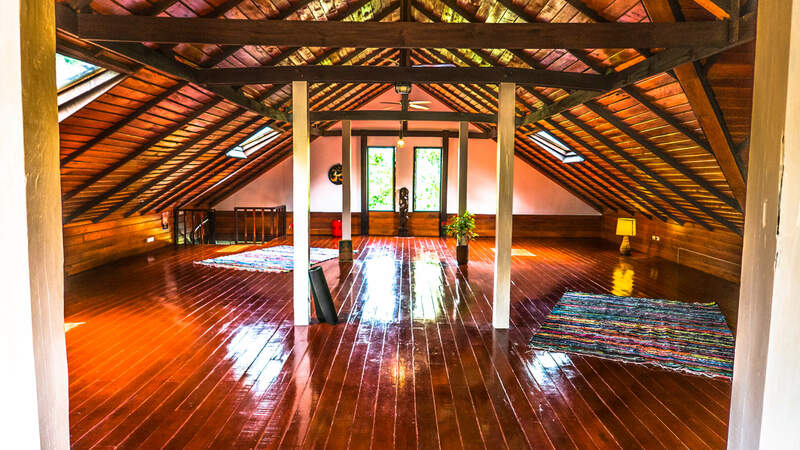 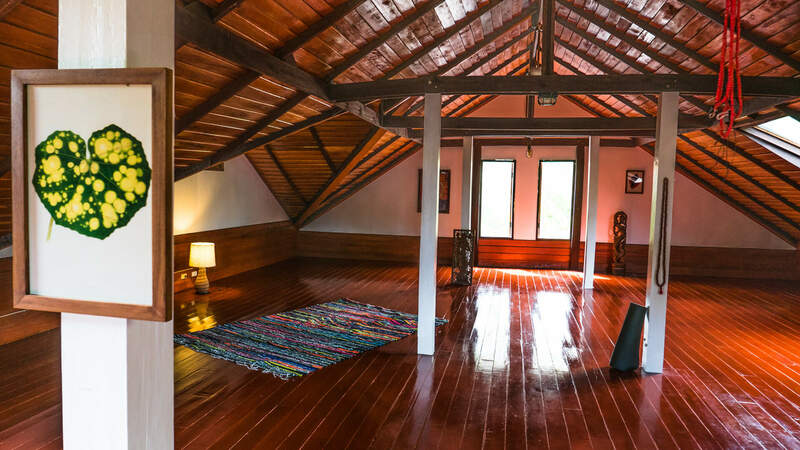 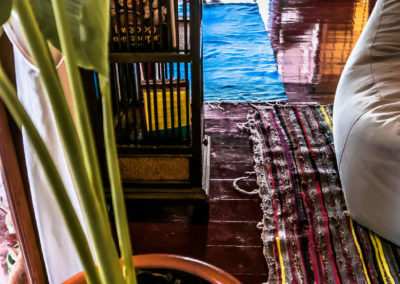 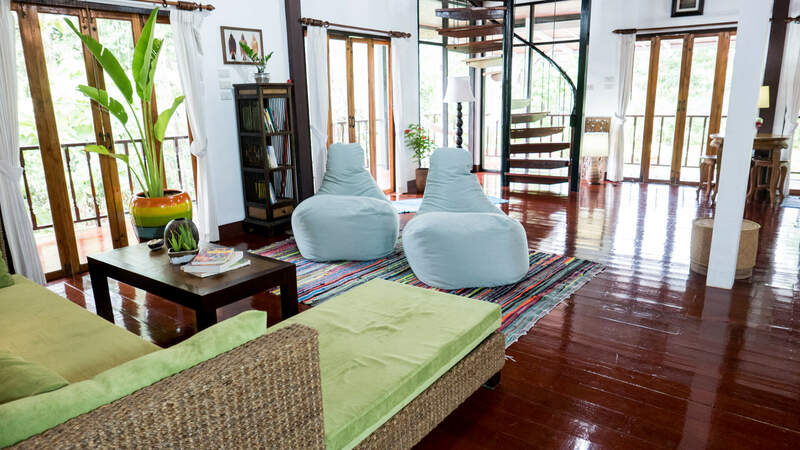 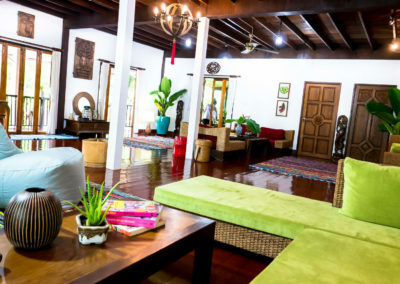 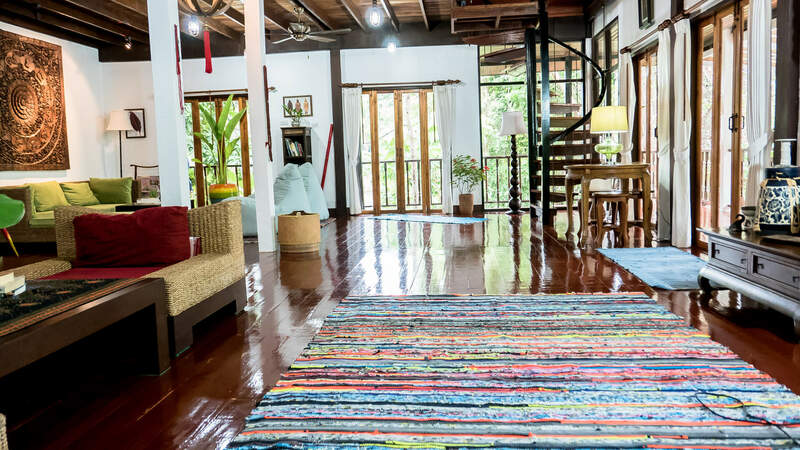 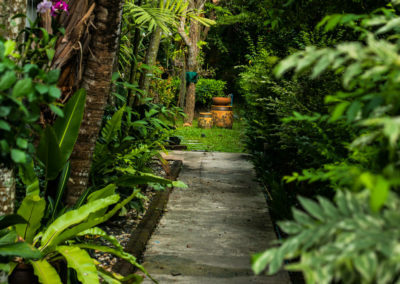 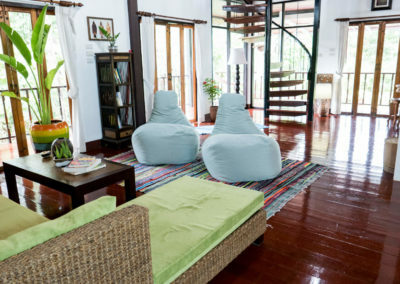 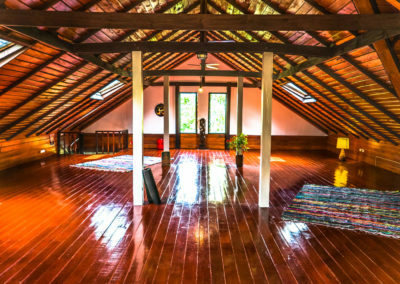 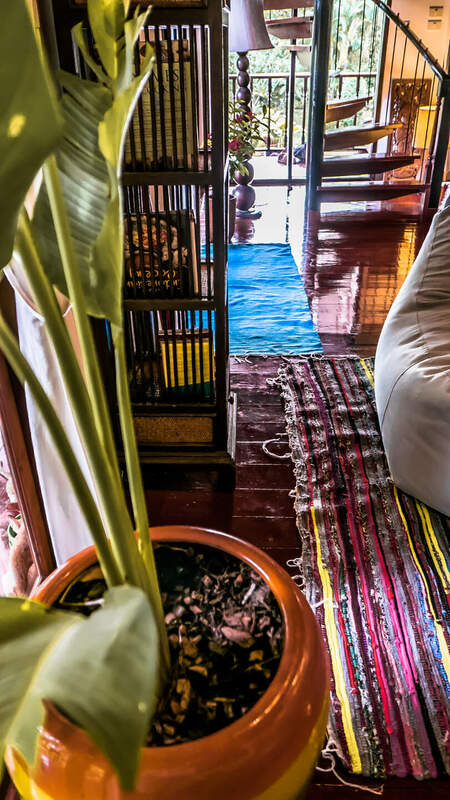 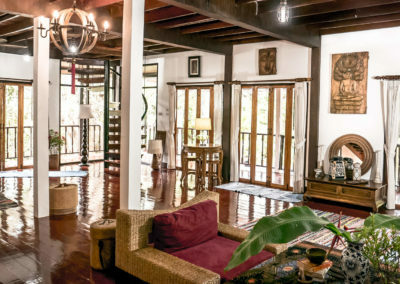 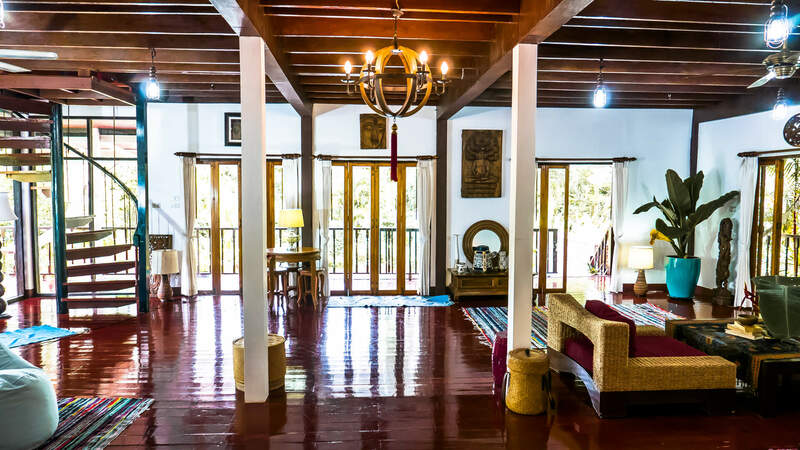 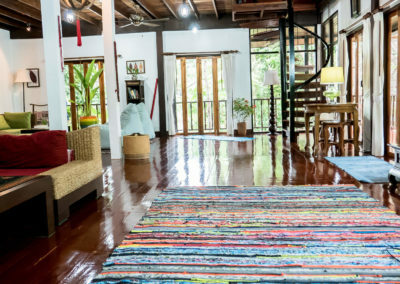 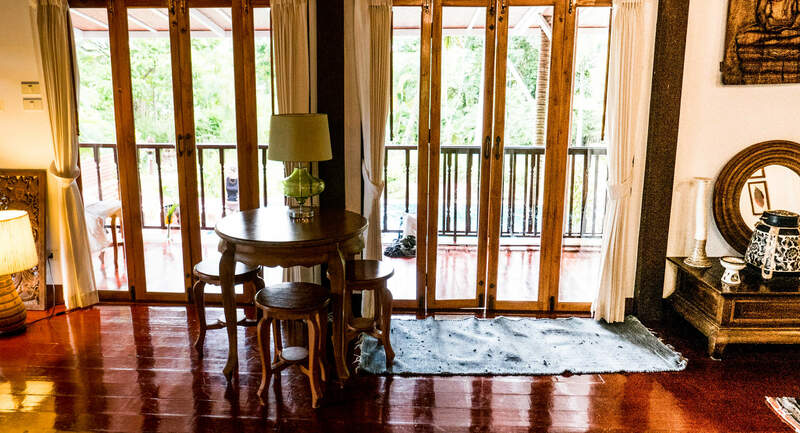 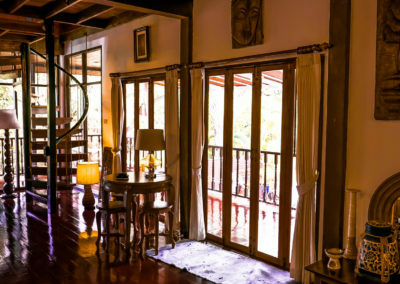 The yoga house in Koh Phangan offers a unique space for hosting retreats, workshops and special events. 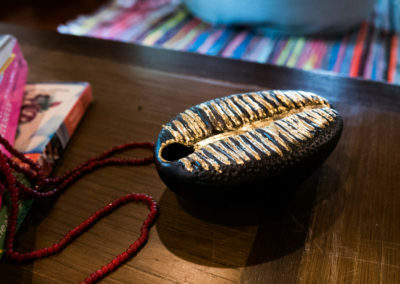 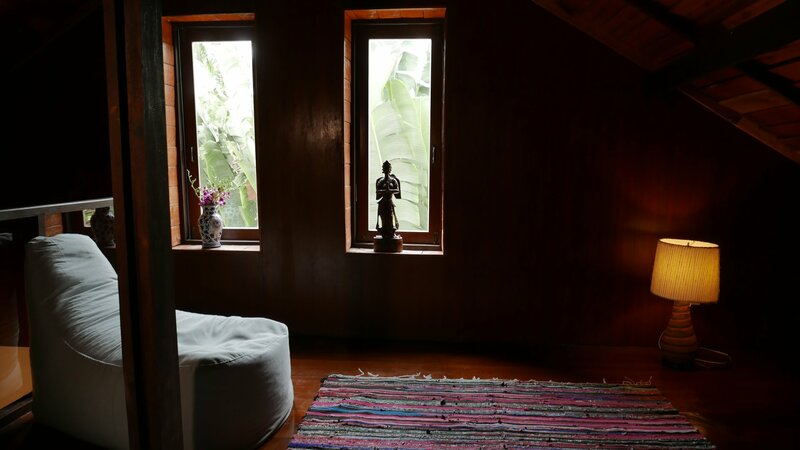 We aim to create an inspiring and supportive atmosphere where groups and individuals can learn and experience different practices and techniques of self awareness and personal expansion. 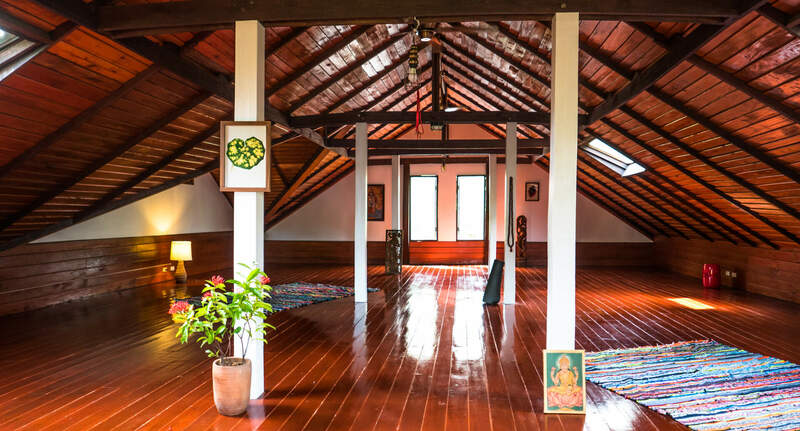 Yoga retreats, tantra and meditation courses, music and dance workshops, lectures, cultural gatherings and many more. 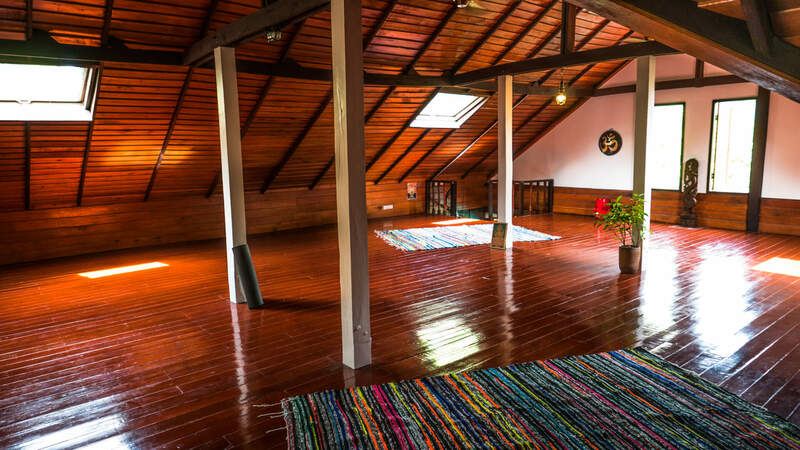 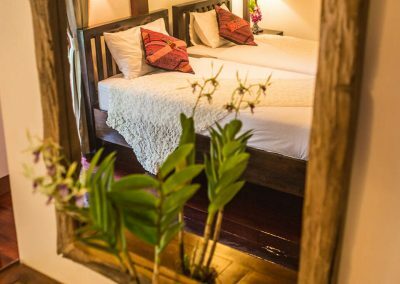 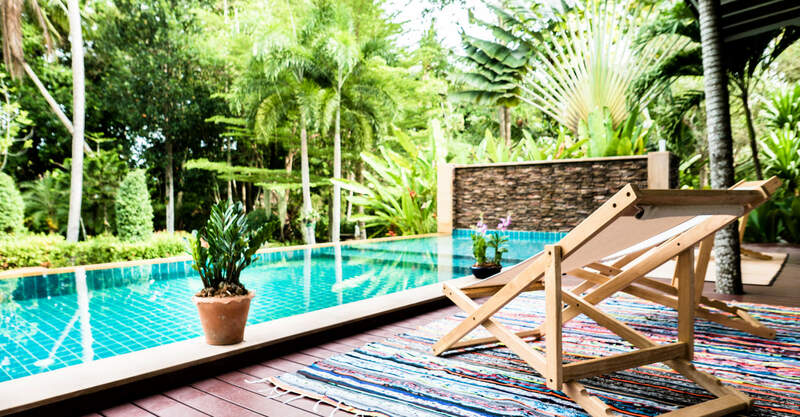 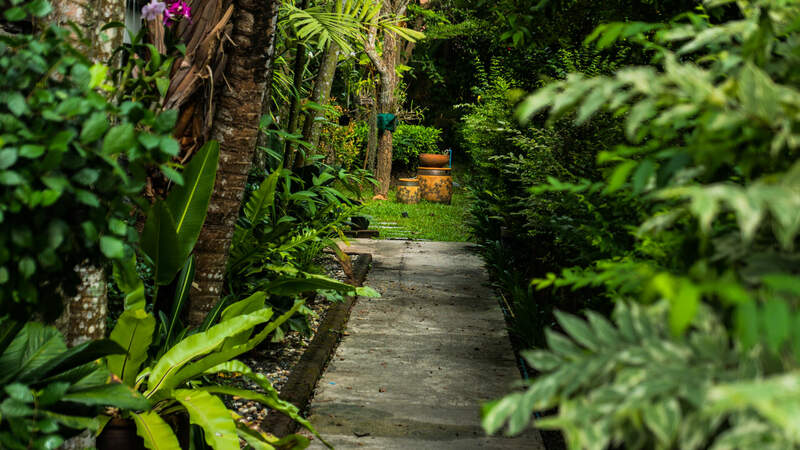 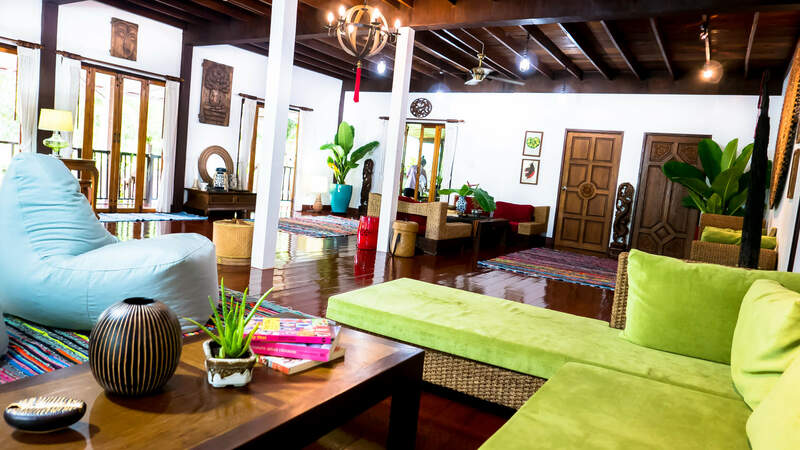 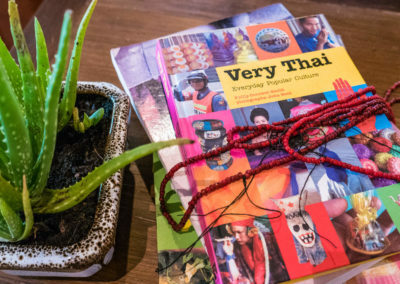 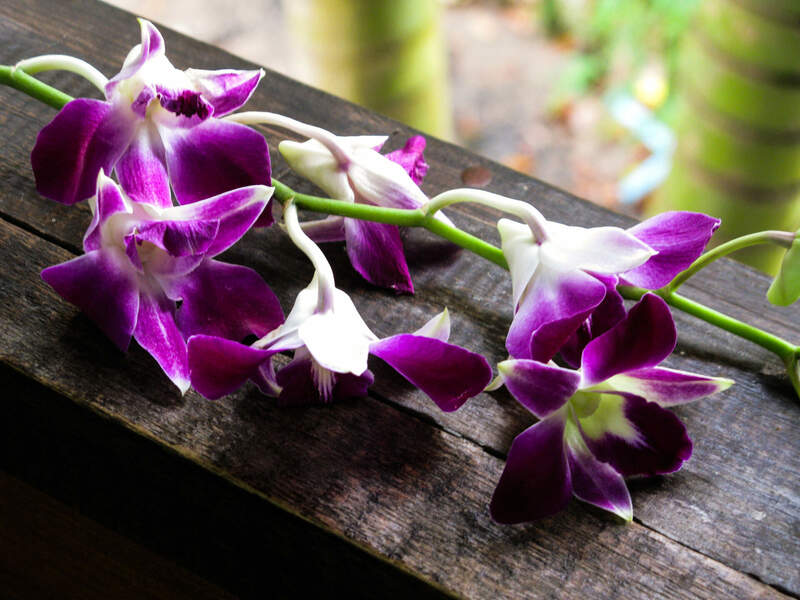 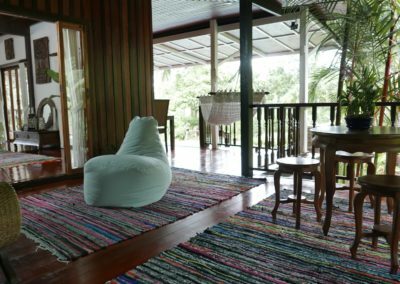 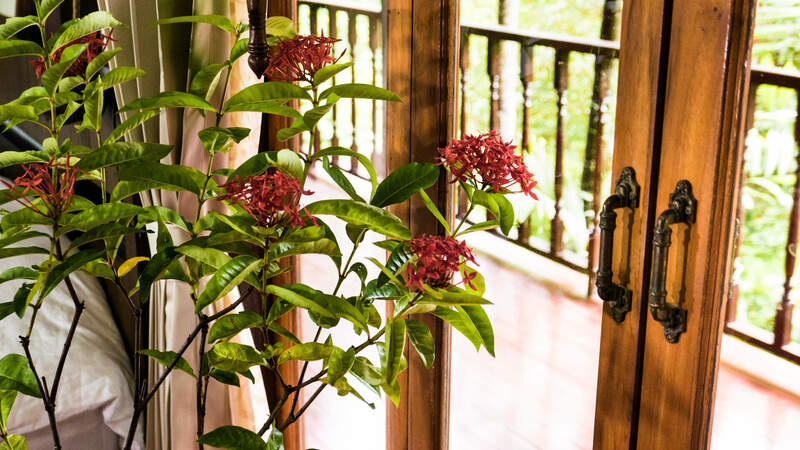 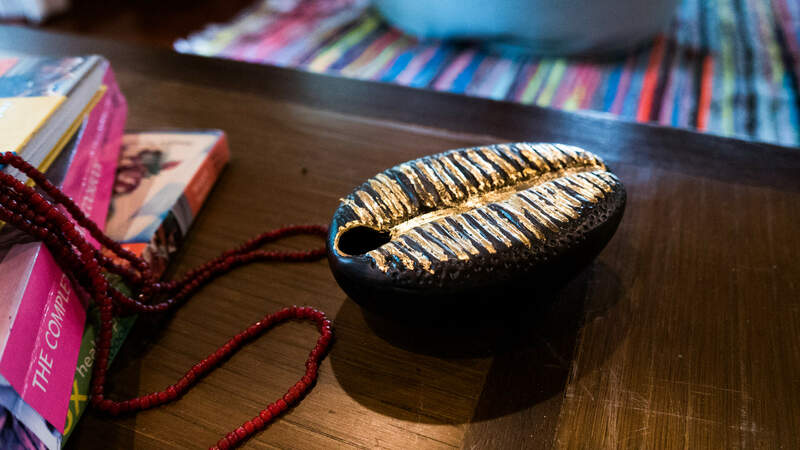 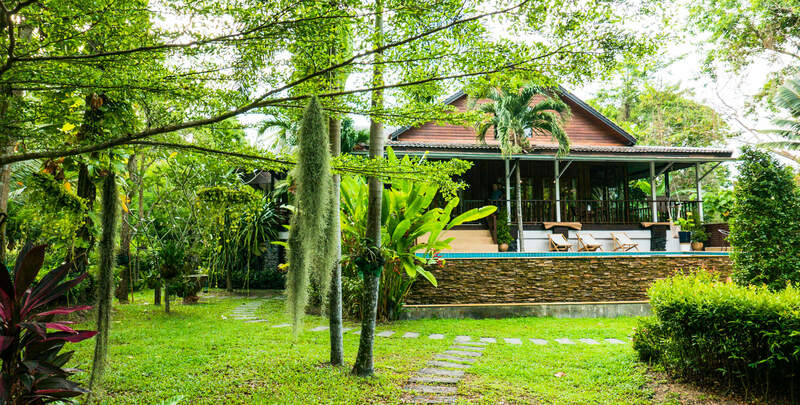 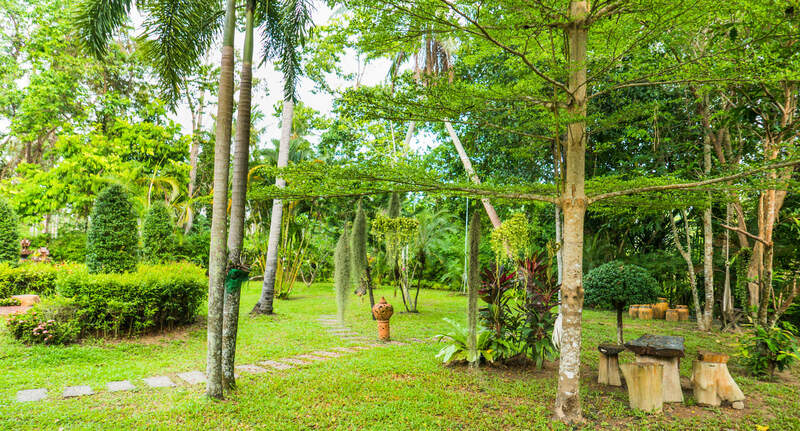 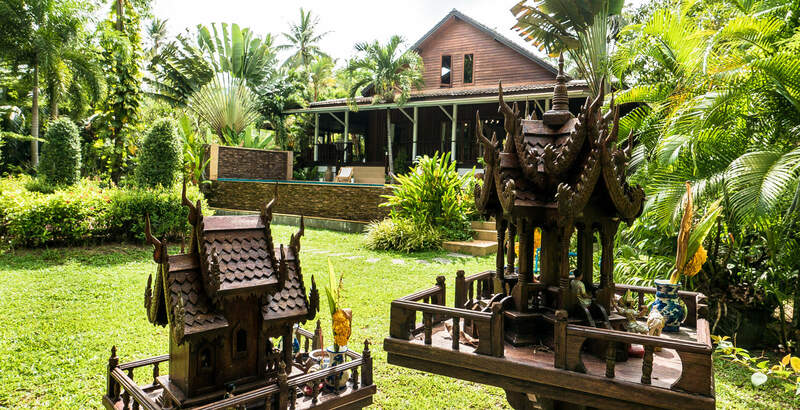 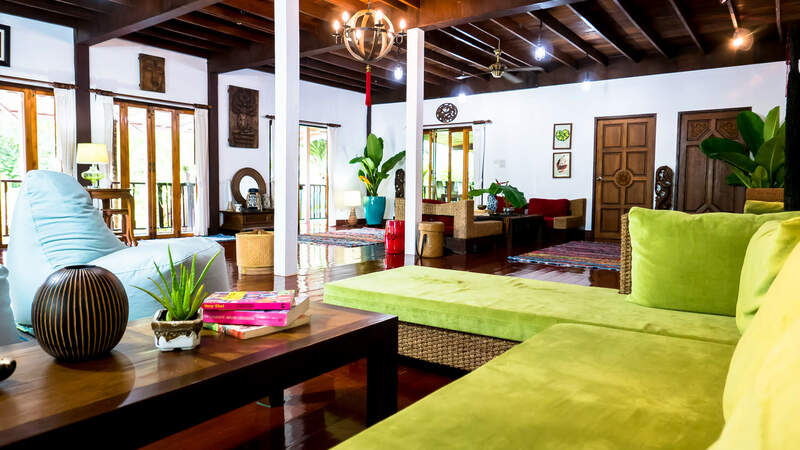 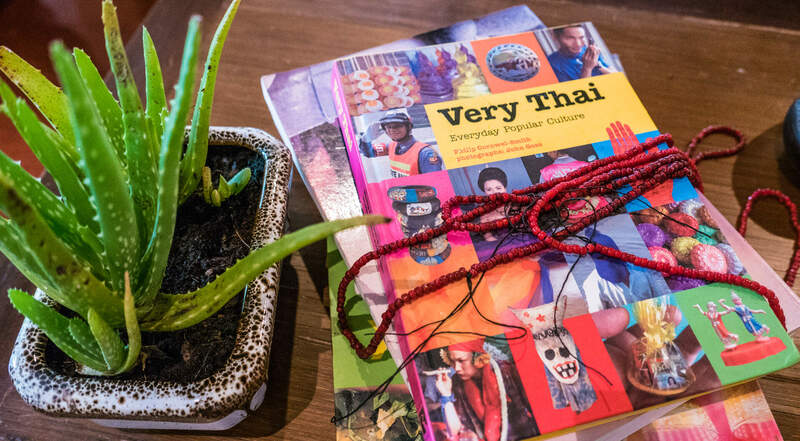 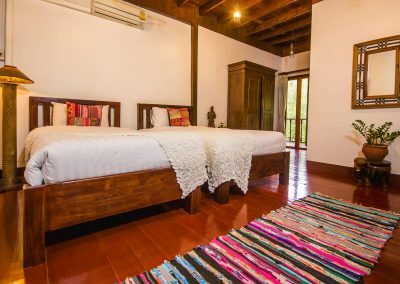 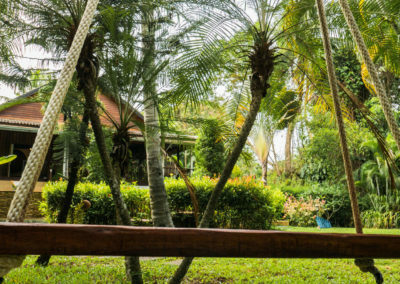 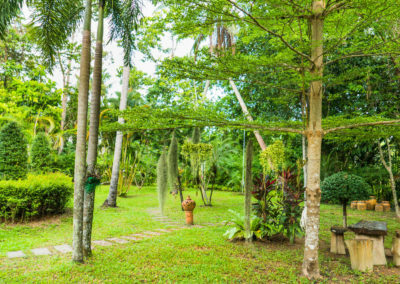 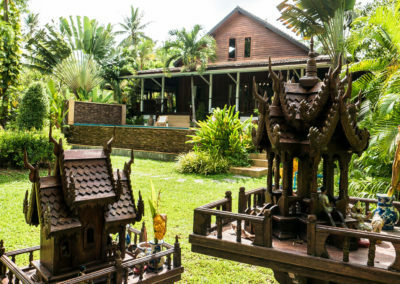 With its natural surrounding and intimate setting, The Yoga House is a perfect place for a wide range of activities and workshops and at the same time it is ideal for relaxing ,taking time out, and experiencing Koh Phangan’s special vibe. 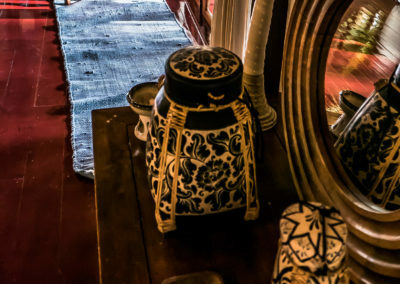 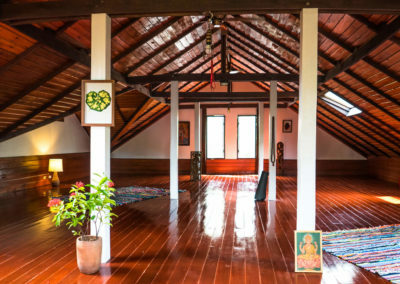 The Yoga House is known for its amazing Yoga Shala. 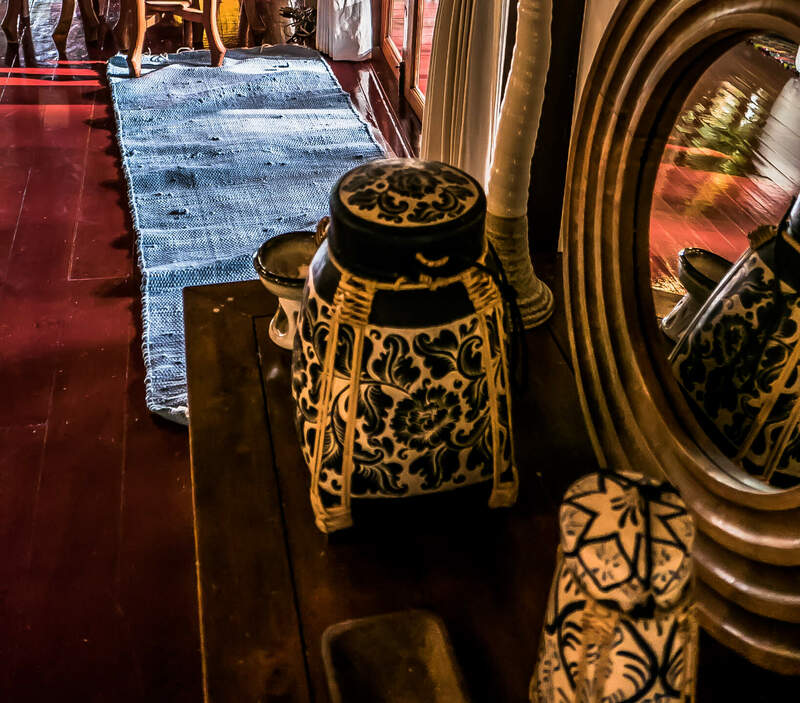 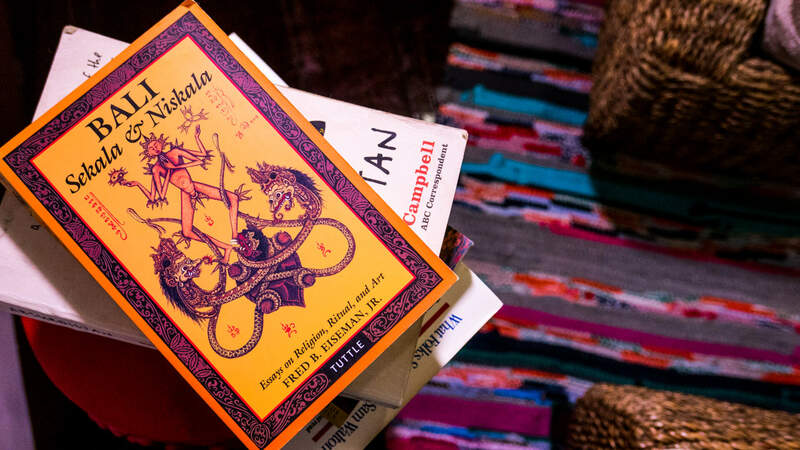 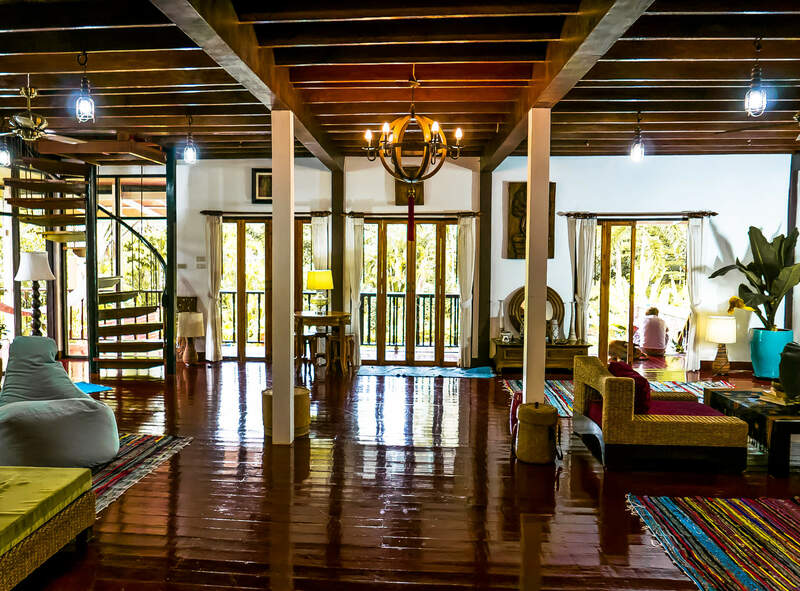 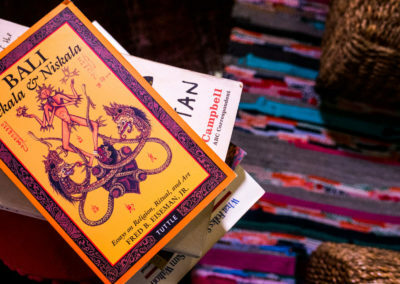 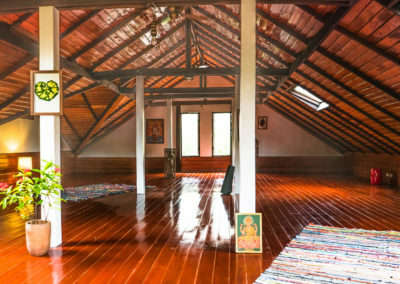 The Shala can hold 30-40 practitioners and is suitable for a wide range of activities: Yoga, Tantra and Meditation retreats, Teachers Training Courses (TTC), Music and Dance Workshops, Lectures, Cultural Gatherings and many more. 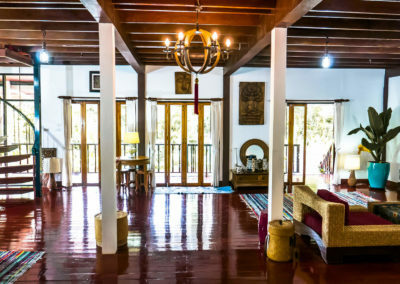 In our large, comfortable living area With many intimate niches and places to hang around, socialize or to just be with yourself and reflect. 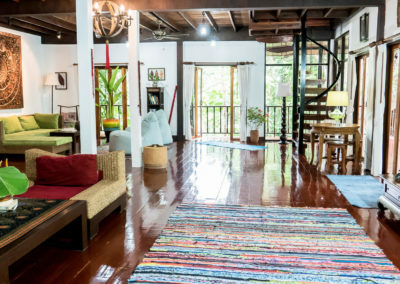 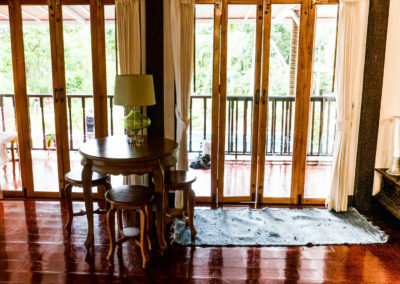 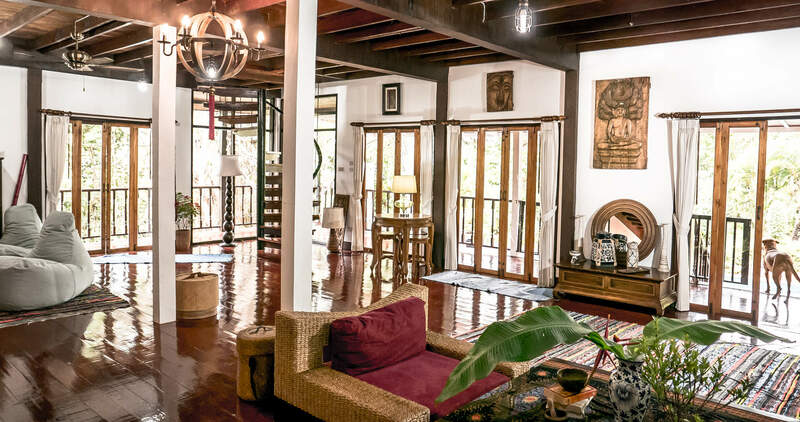 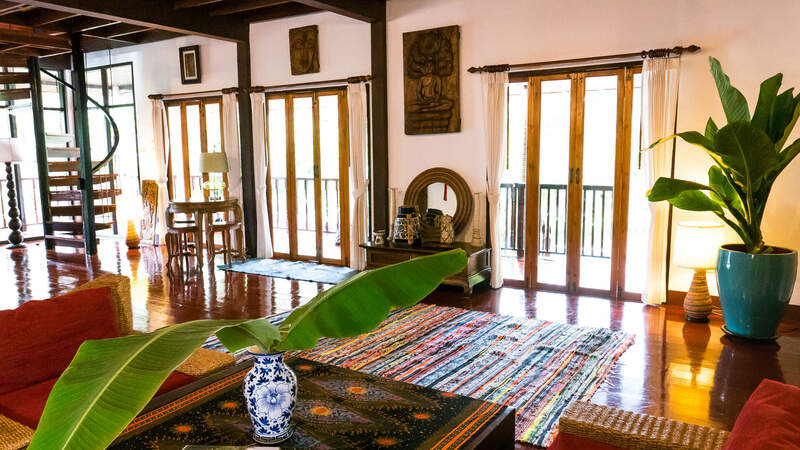 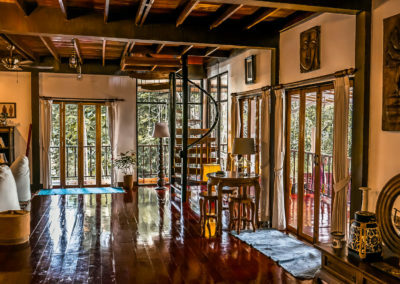 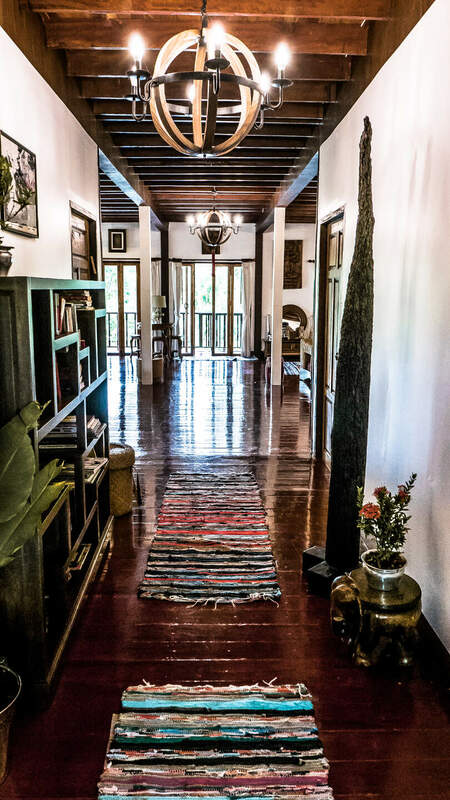 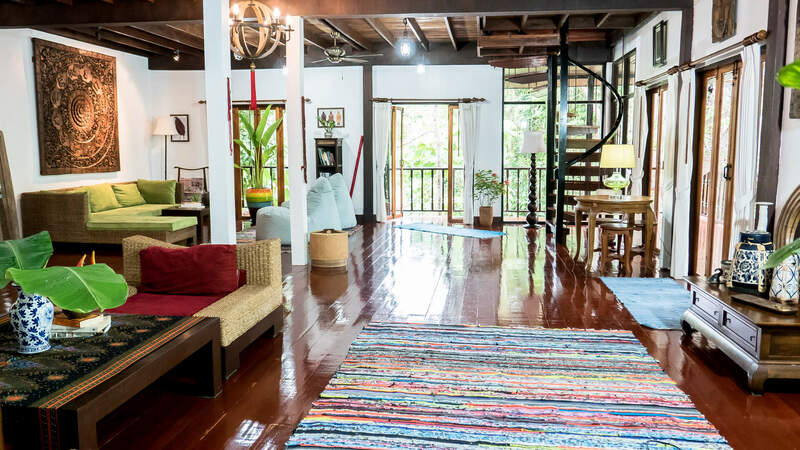 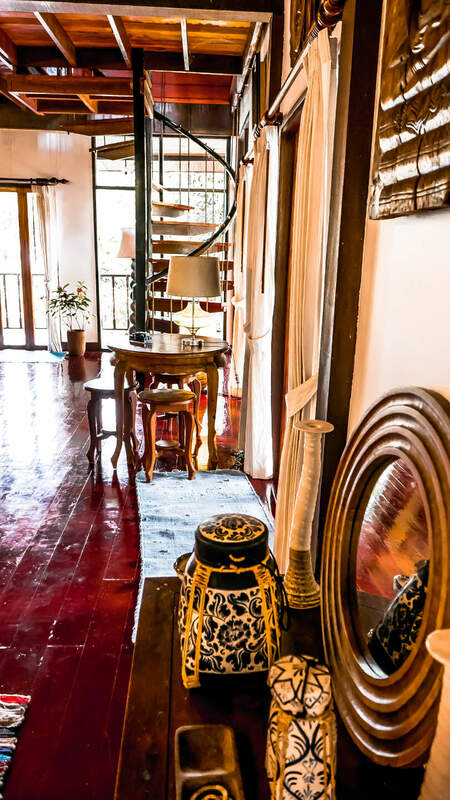 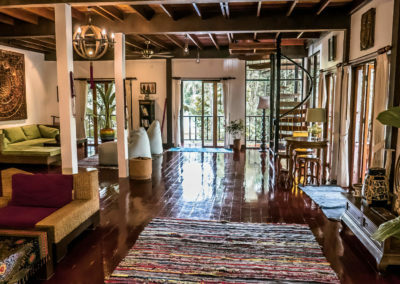 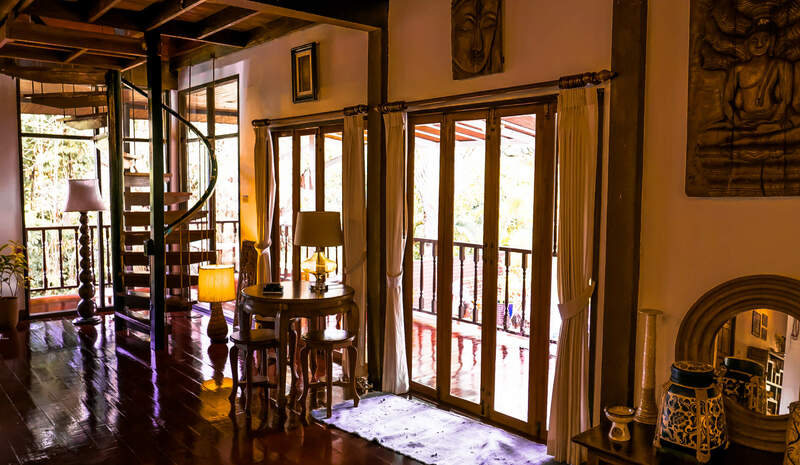 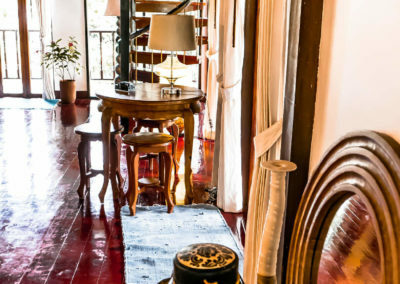 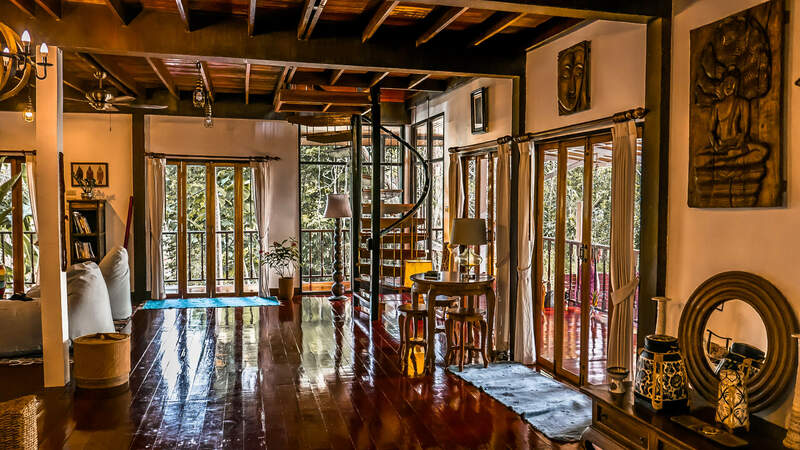 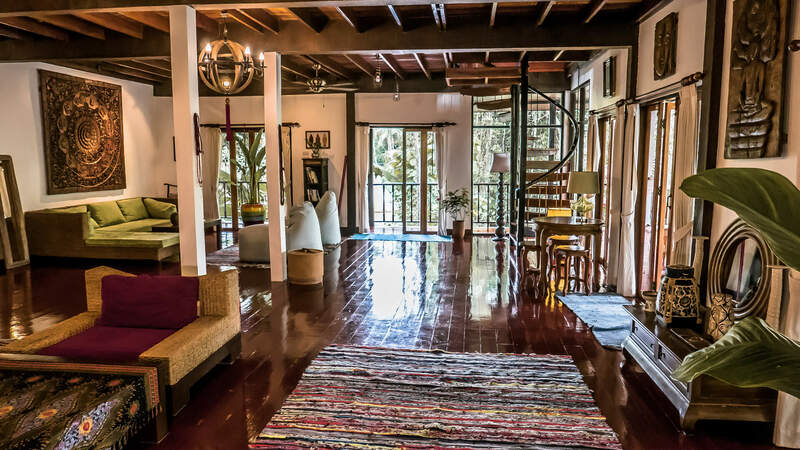 This spacious living area is surrounded by a wide wooden balcony overlooking the beautiful garden and river. 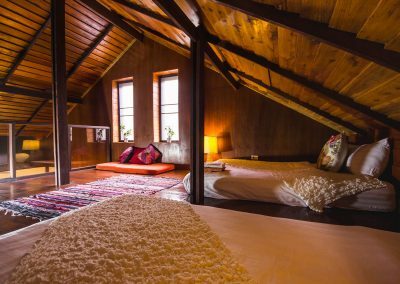 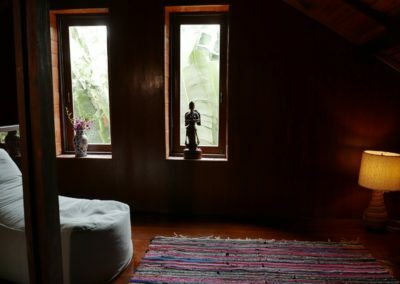 The Yoga House has six spacious bedrooms. 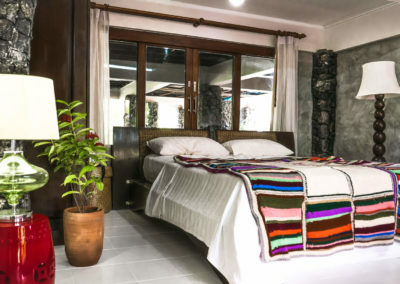 All bedrooms have air conditioning and fans. 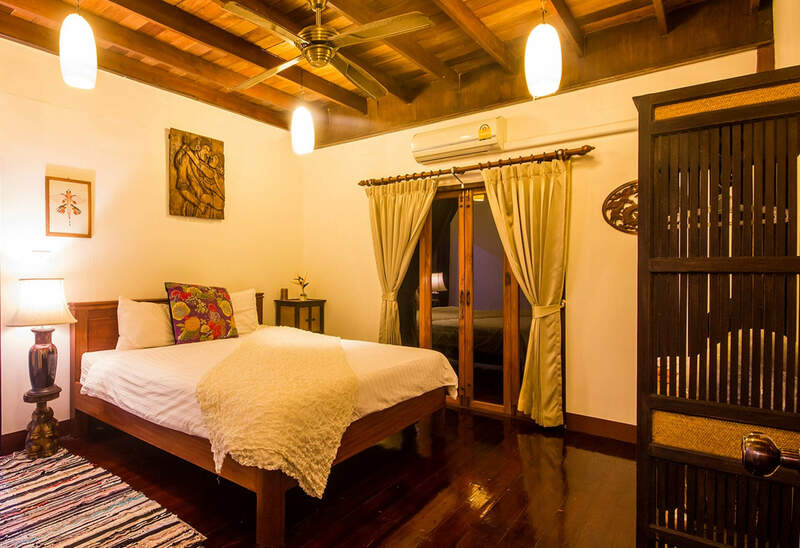 Four rooms have an en suite bathroom and two rooms share a bathroom. 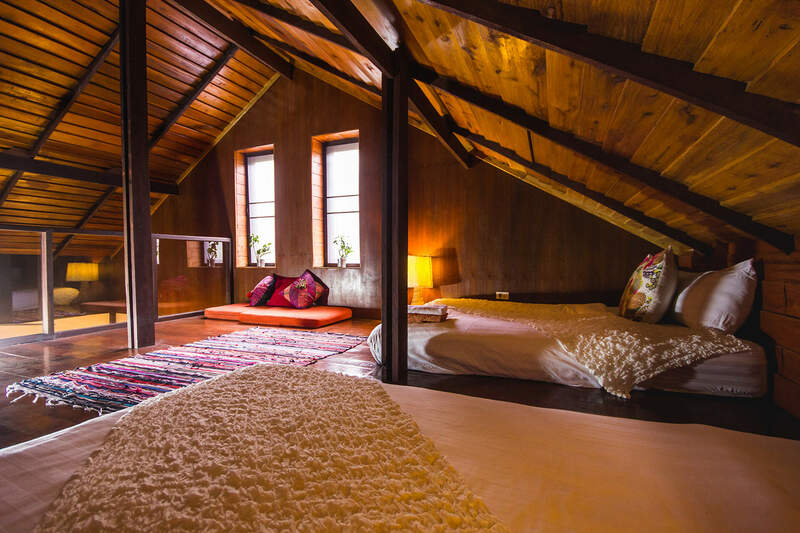 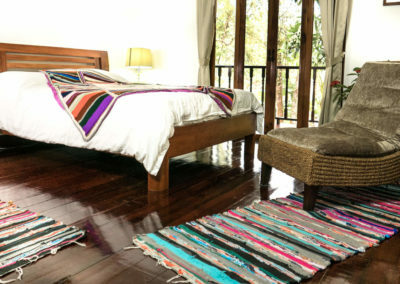 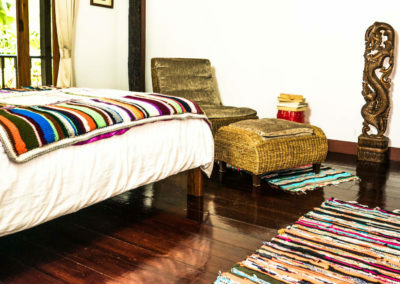 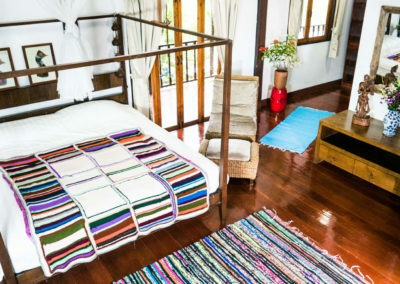 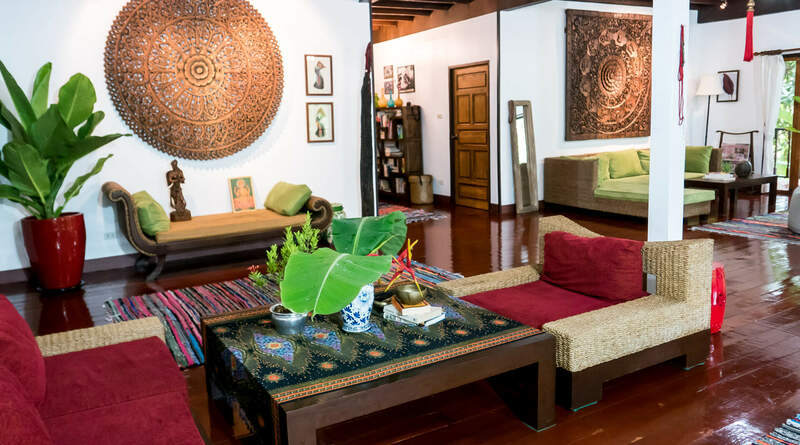 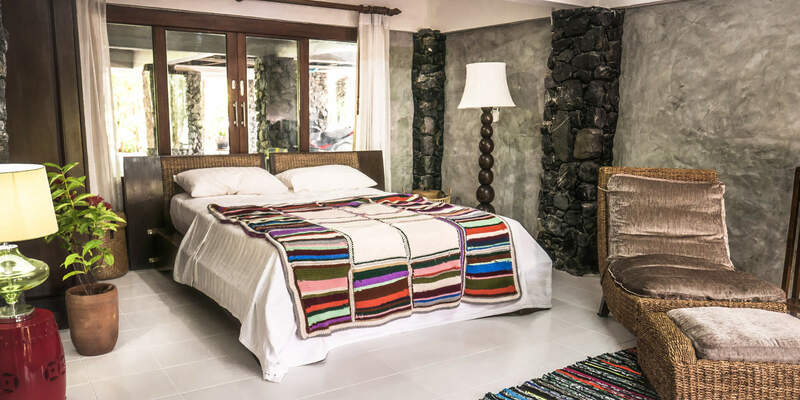 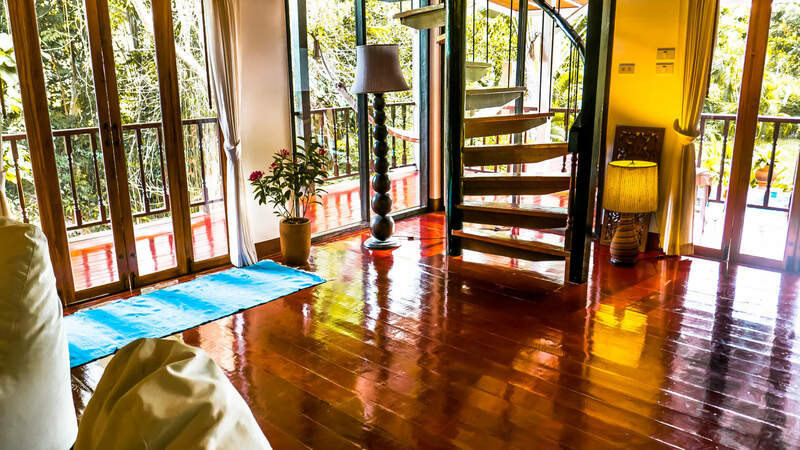 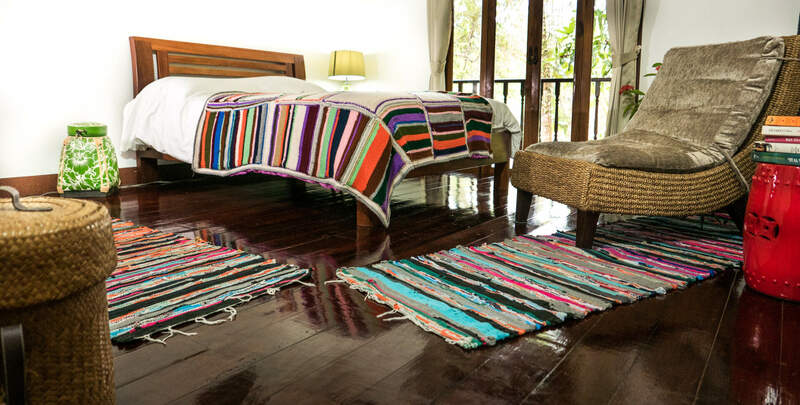 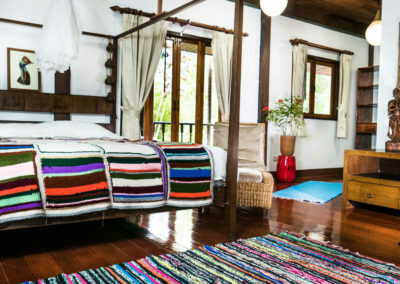 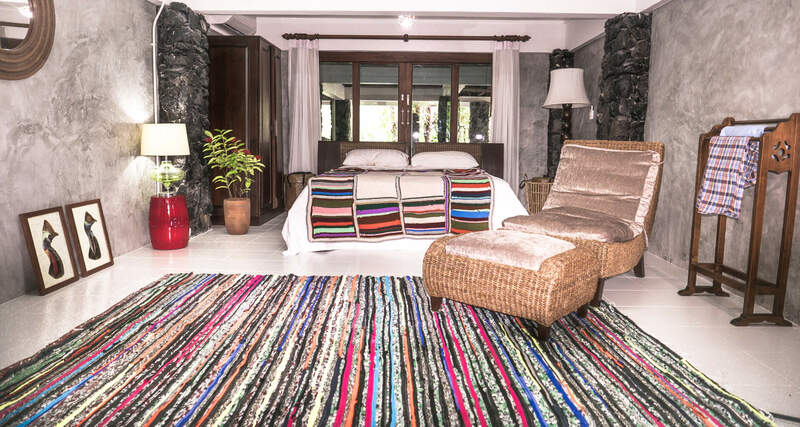 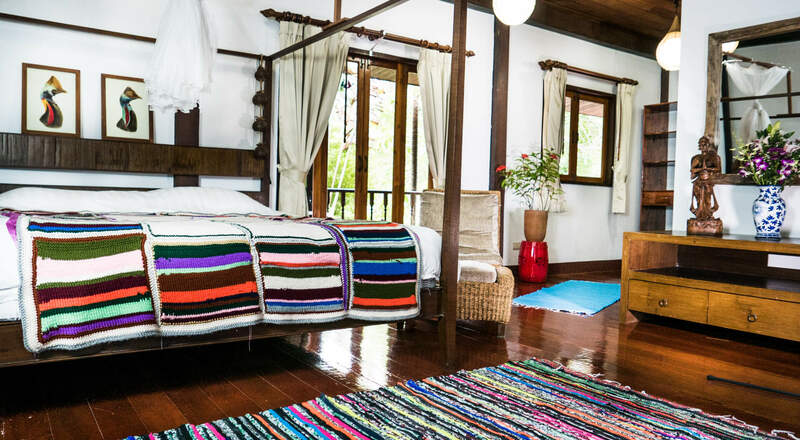 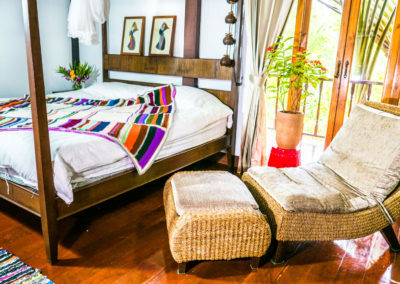 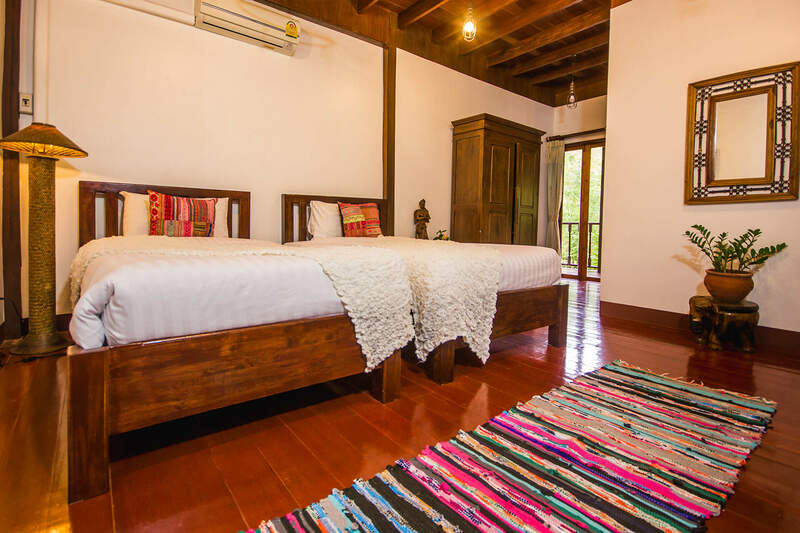 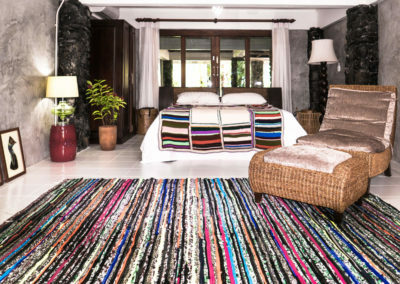 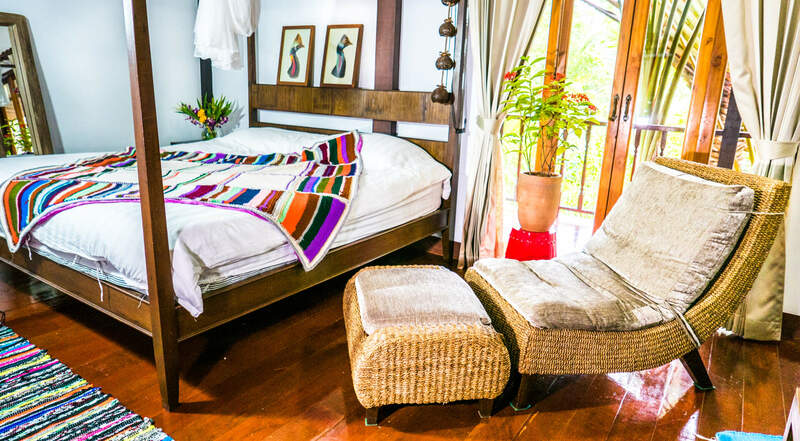 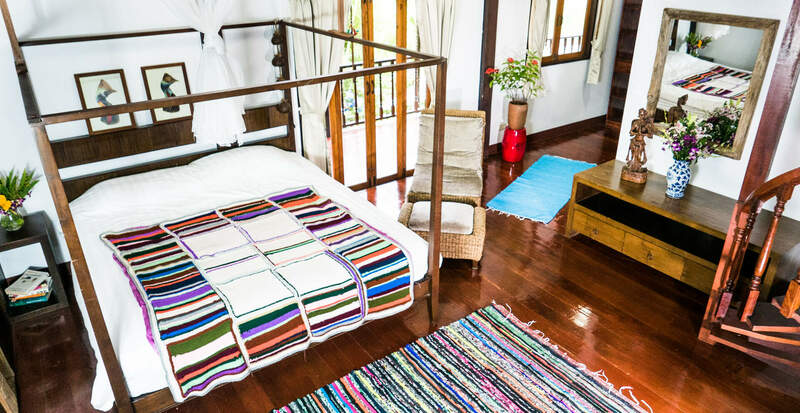 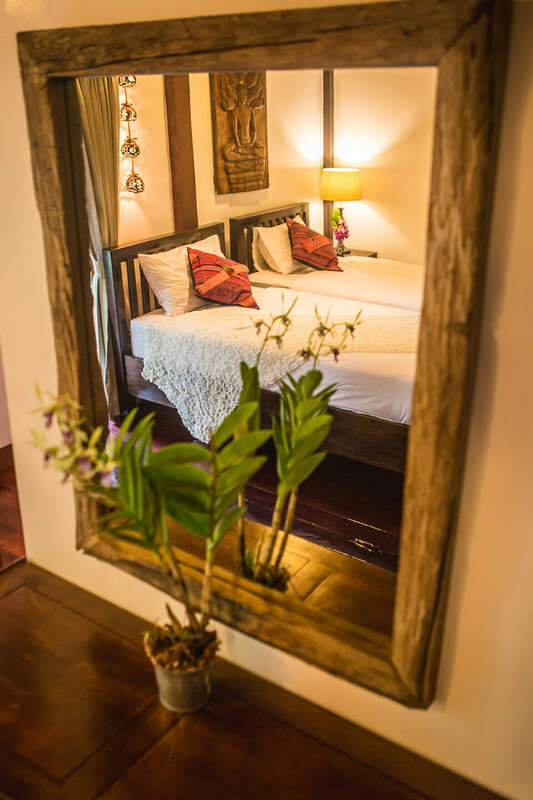 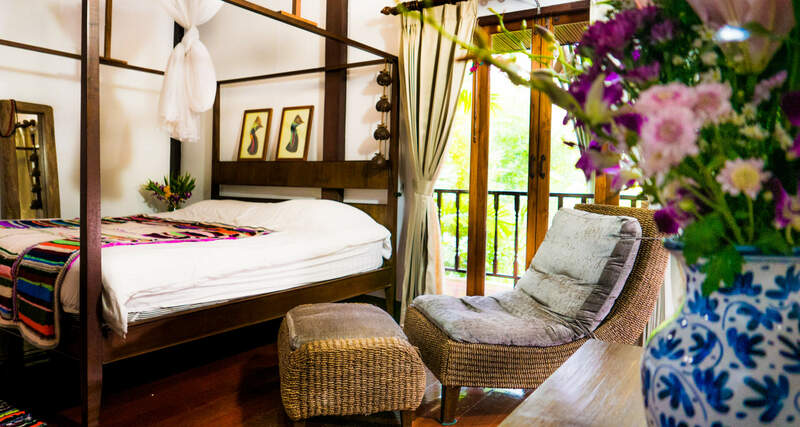 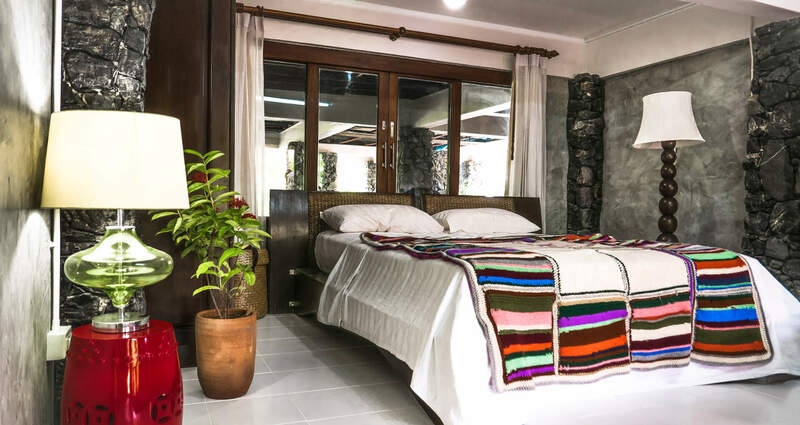 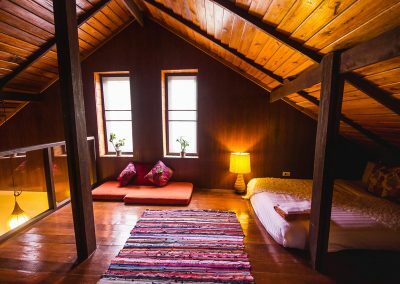 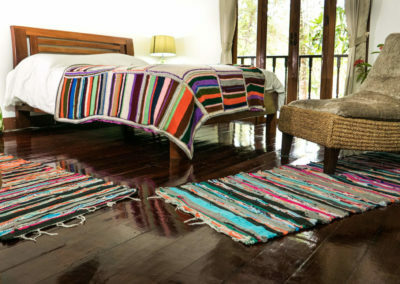 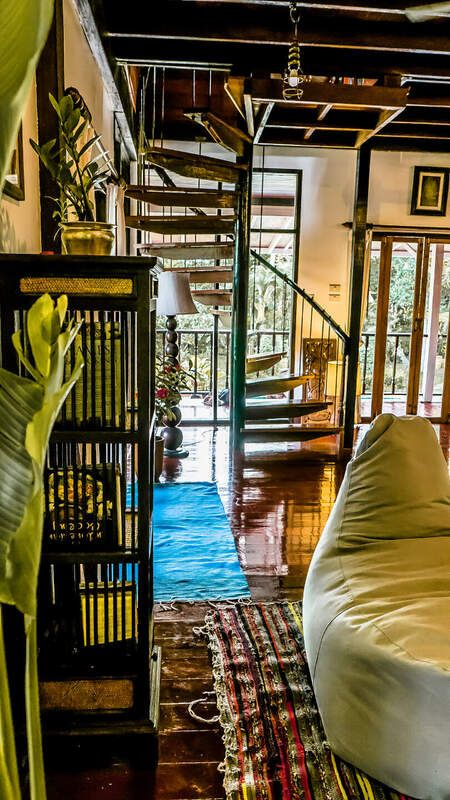 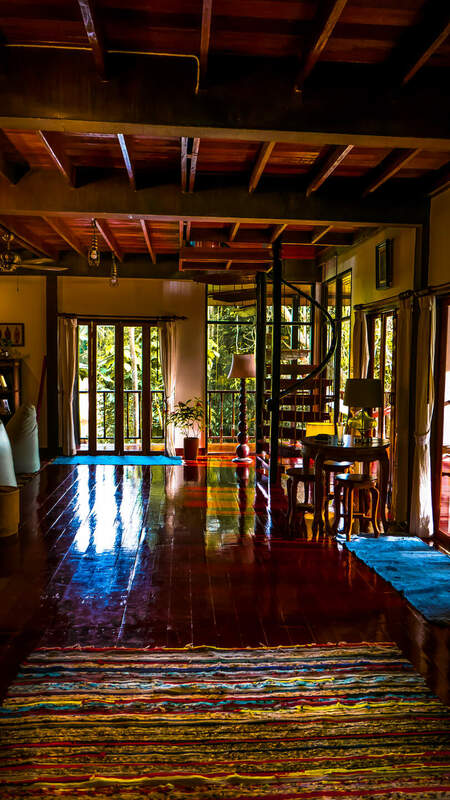 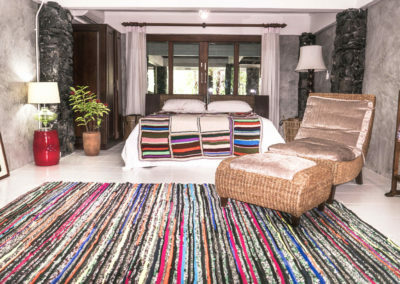 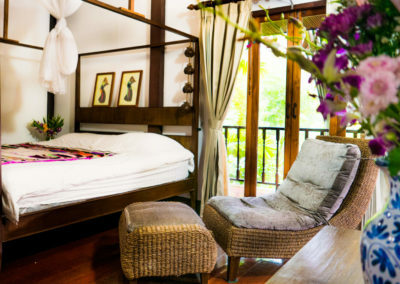 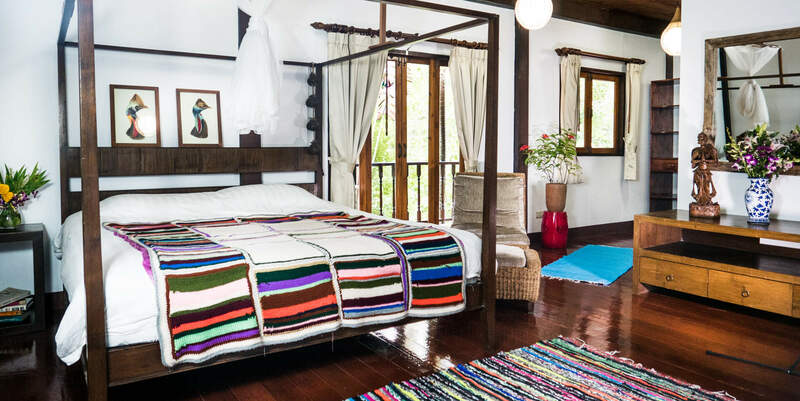 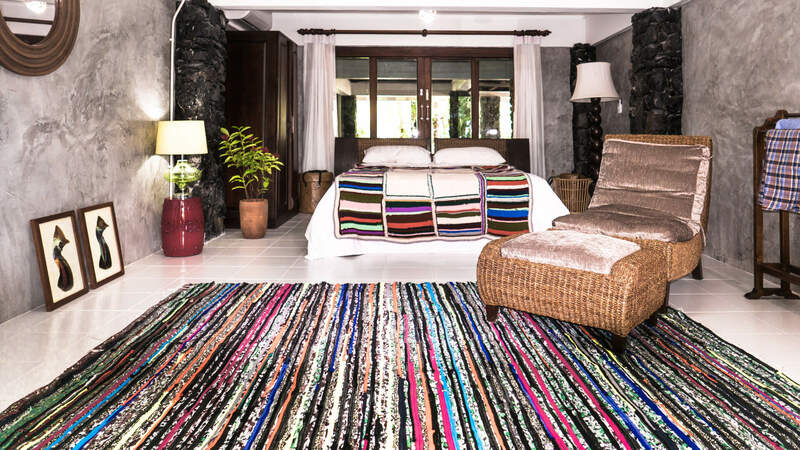 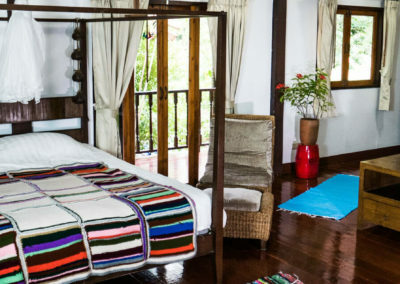 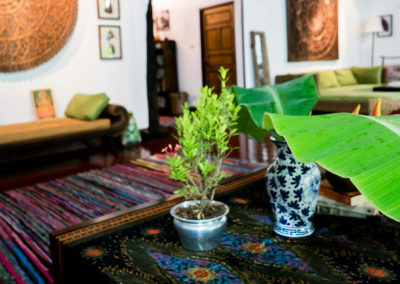 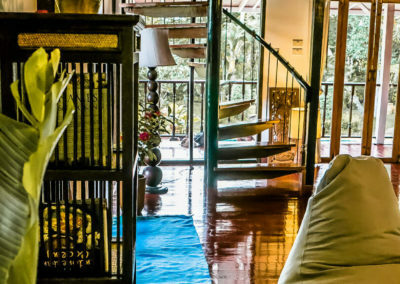 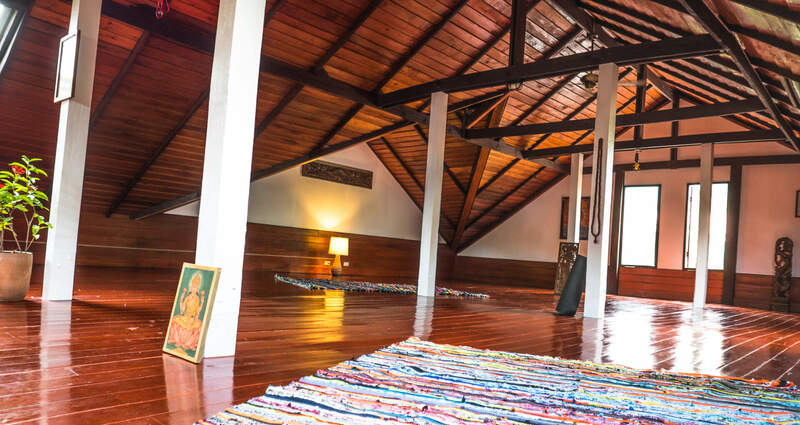 The yogahouse can accommodate comfortably 14 single guests or 7 couples, depending on your group requirements. 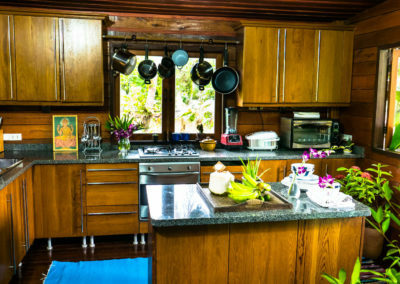 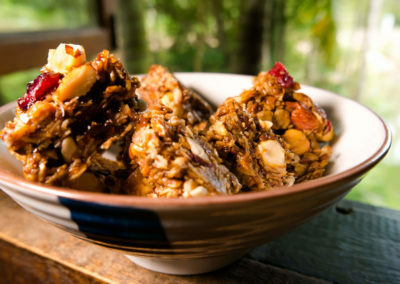 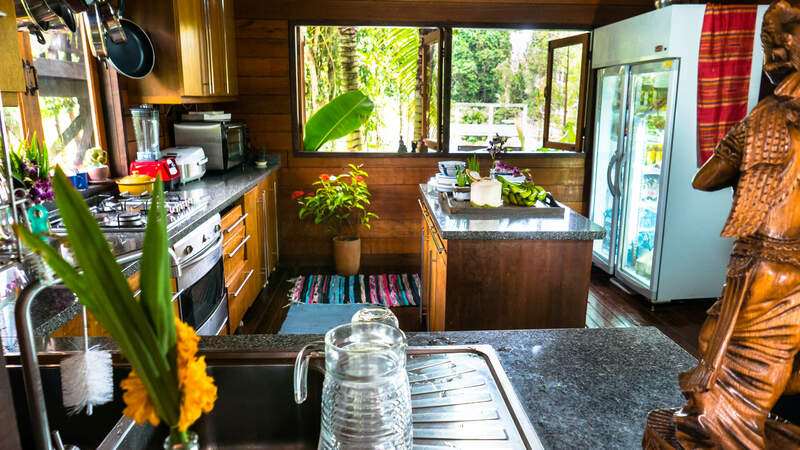 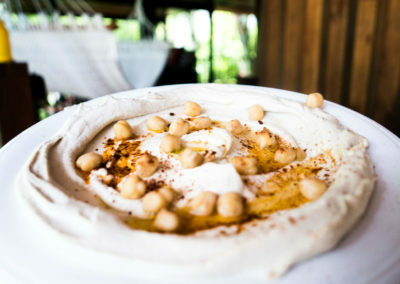 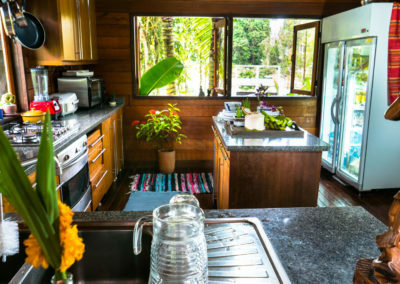 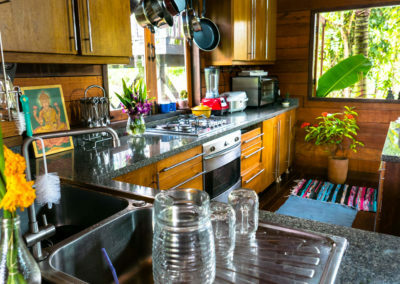 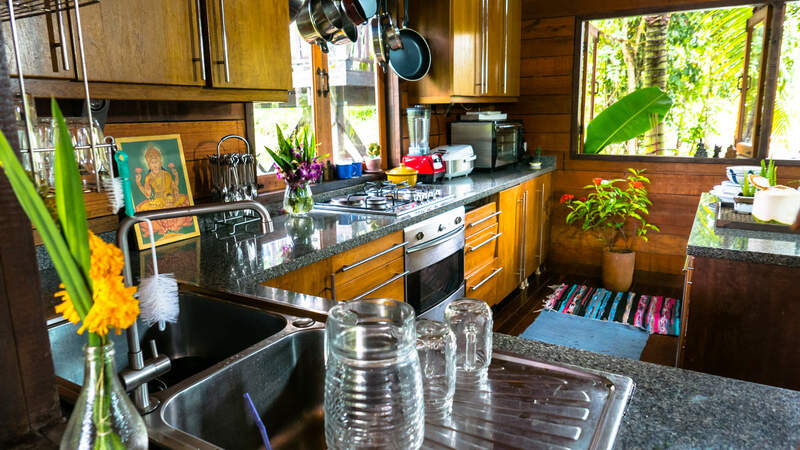 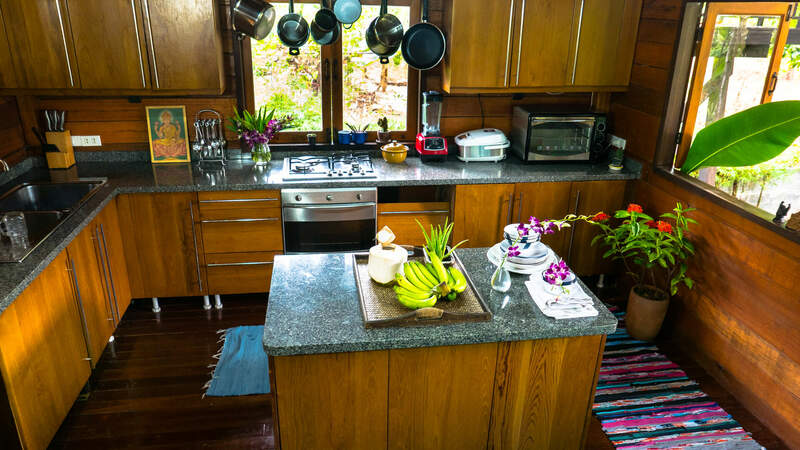 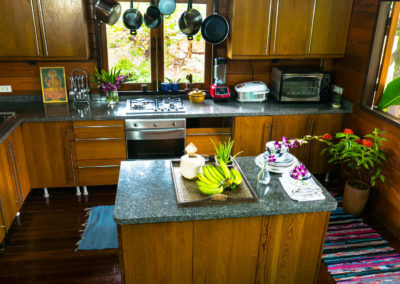 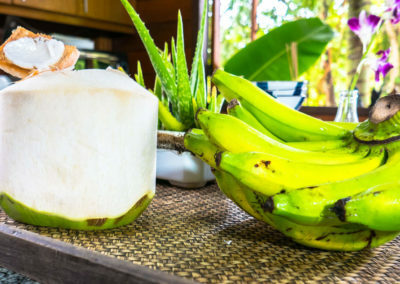 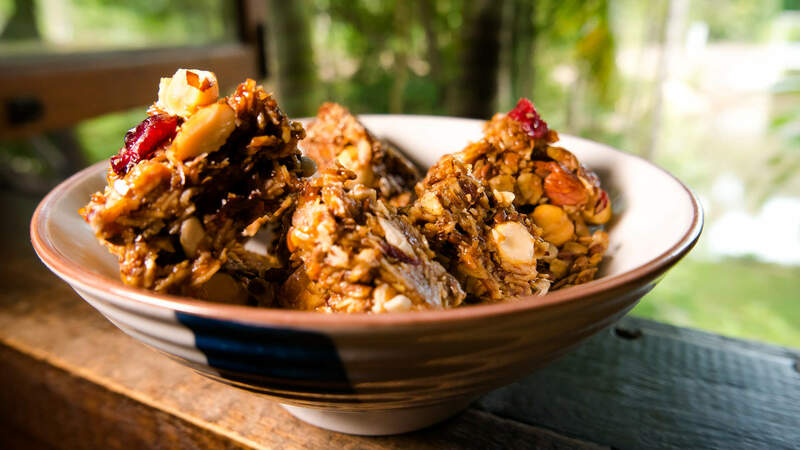 The Yoga House is equipped with a modern kitchen where you can cook for yourself in comfort. 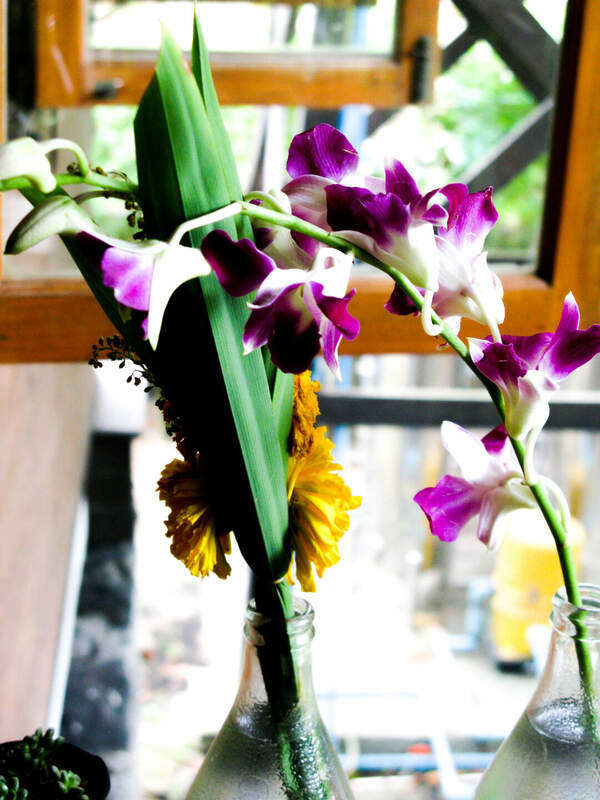 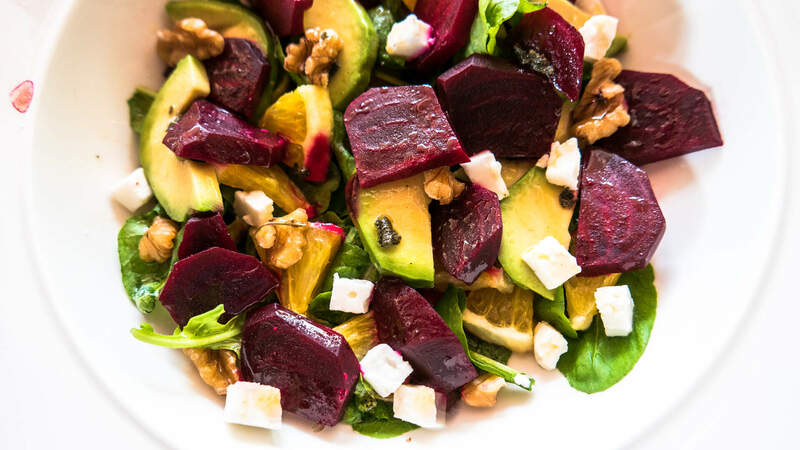 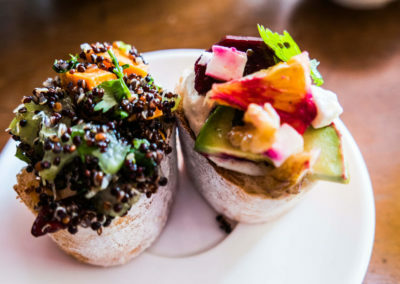 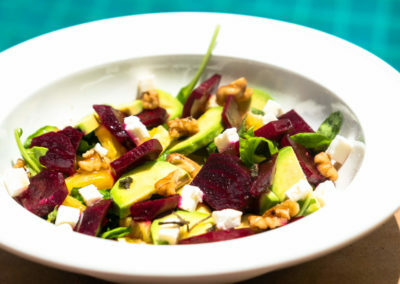 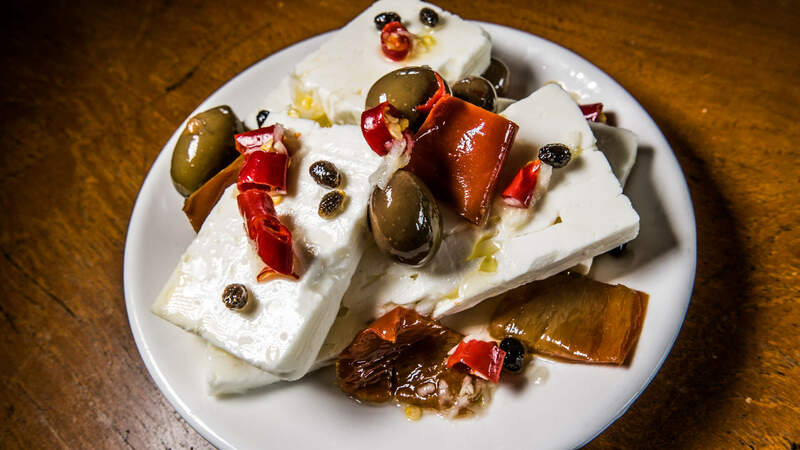 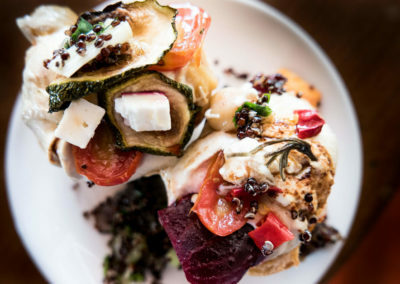 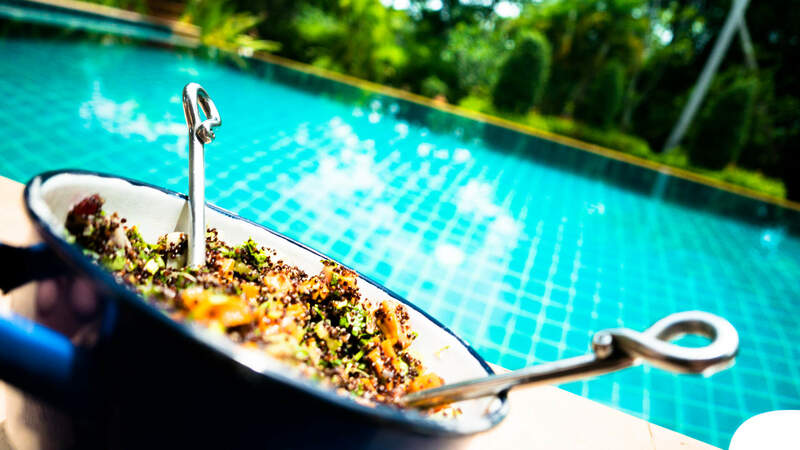 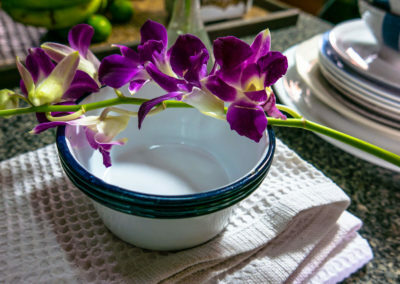 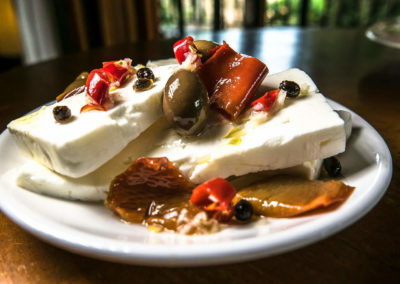 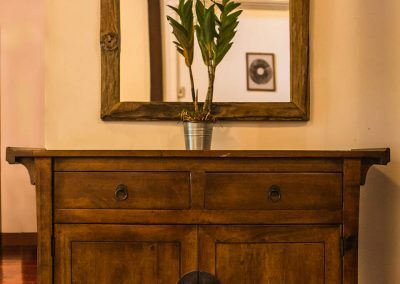 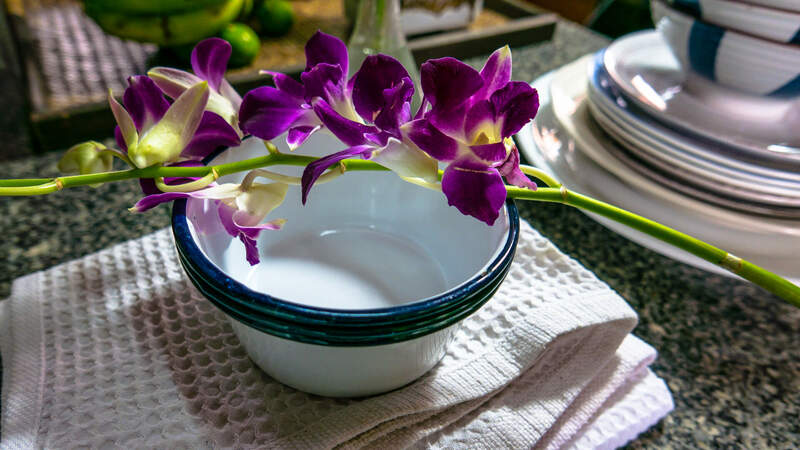 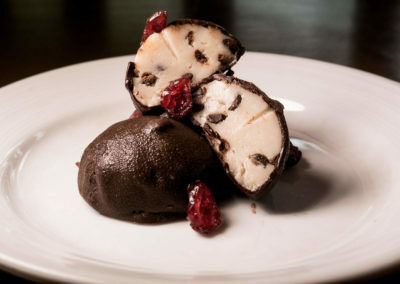 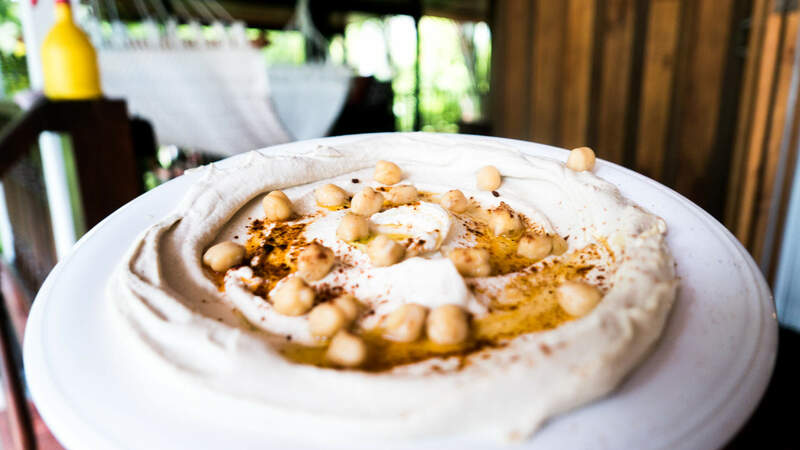 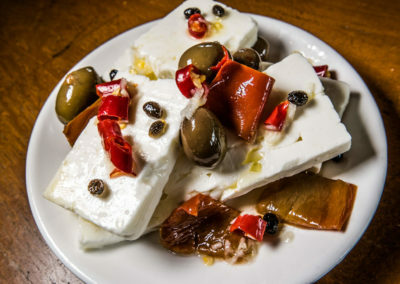 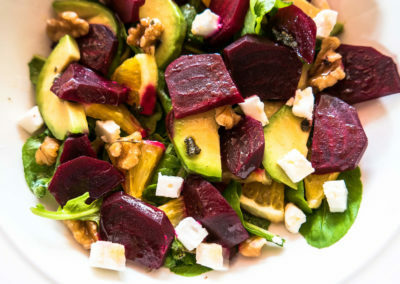 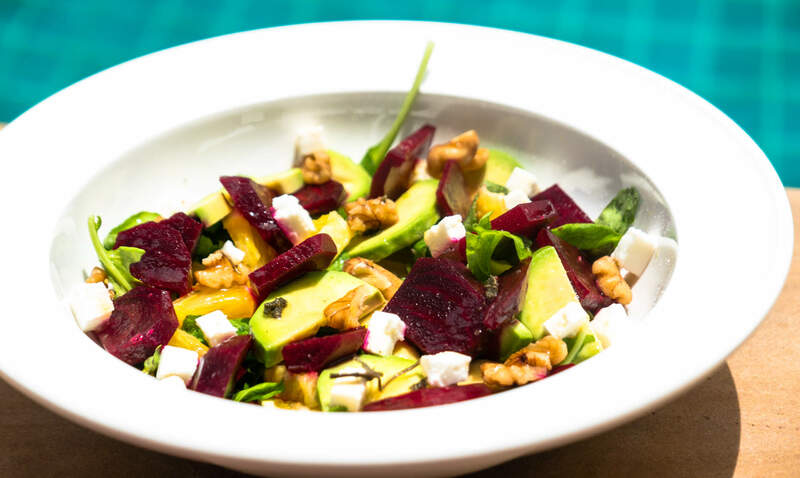 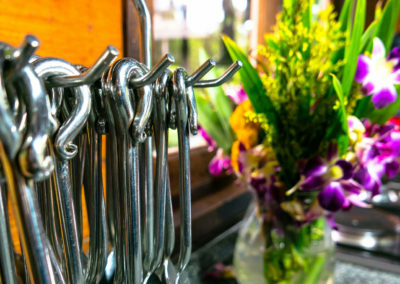 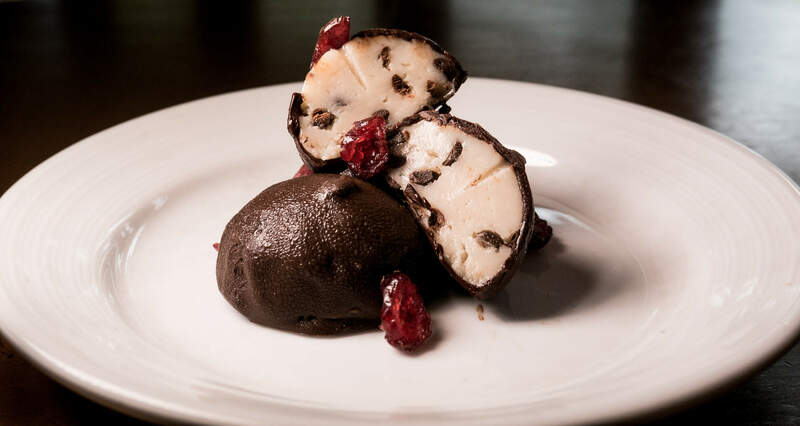 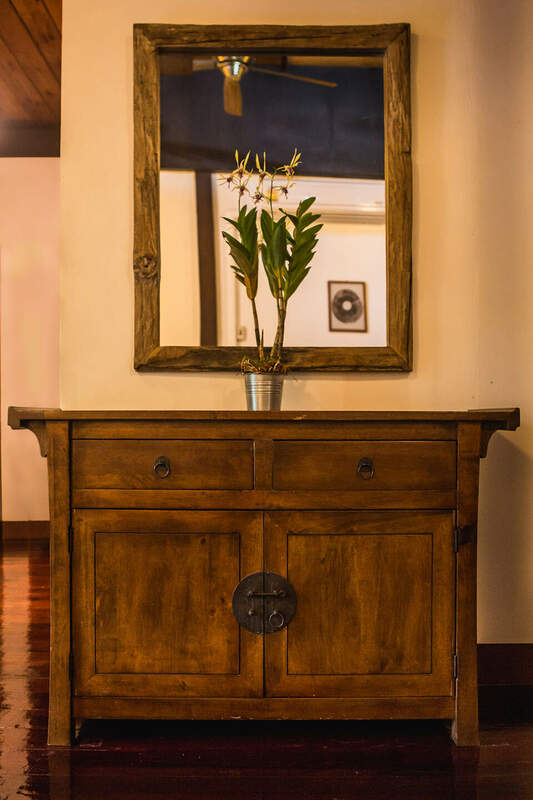 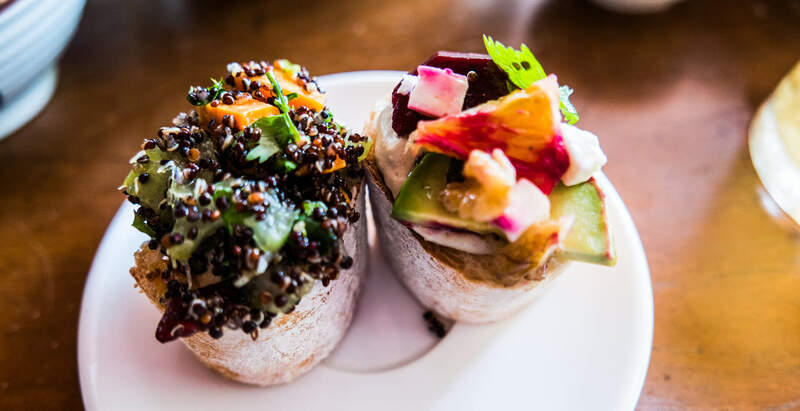 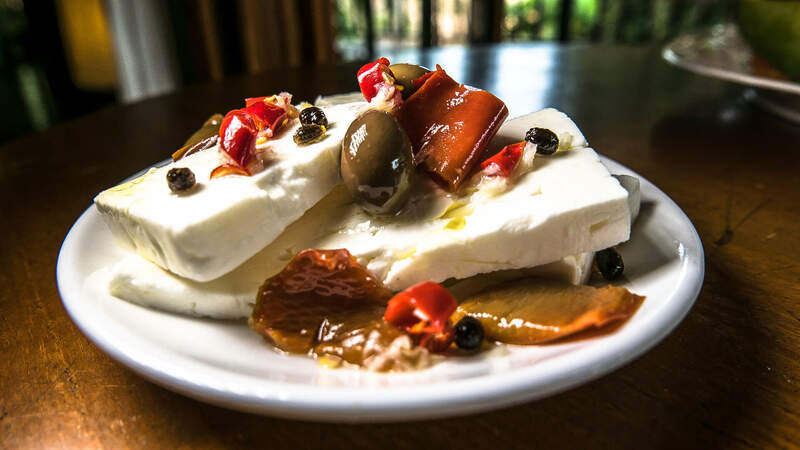 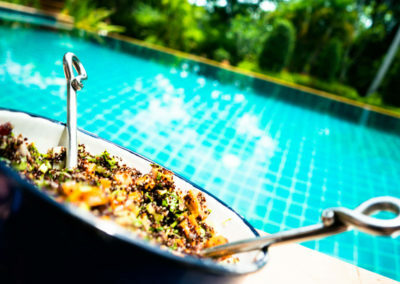 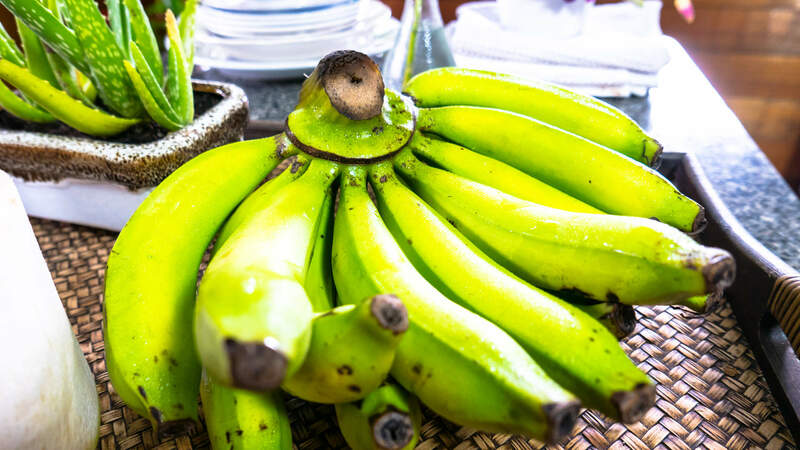 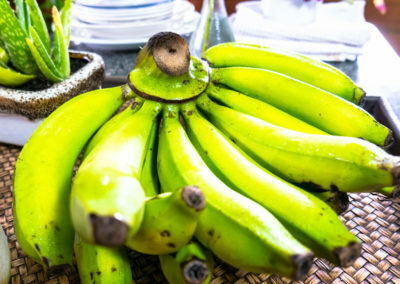 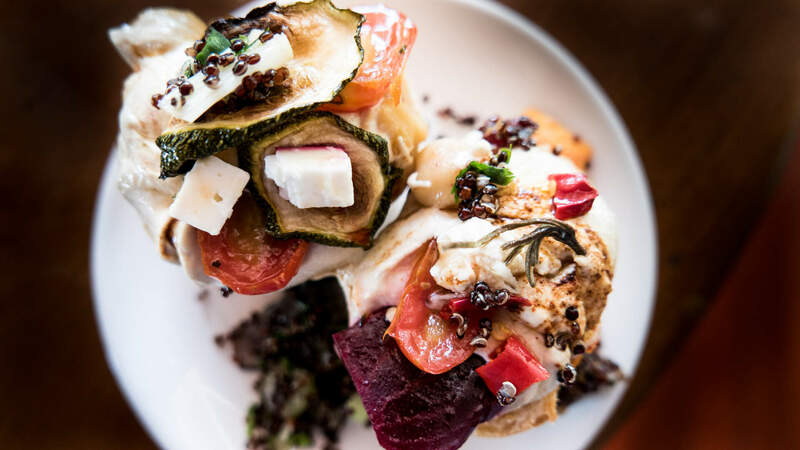 However if you wish, we will be happy to take care of that for you and supply a range of dining options, from special healthy vegetarian meals to local Thai cuisine. 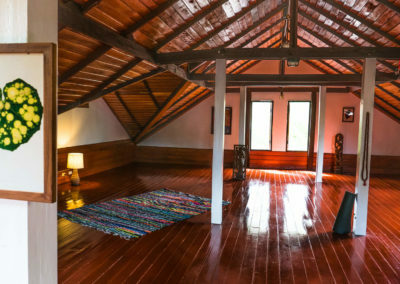 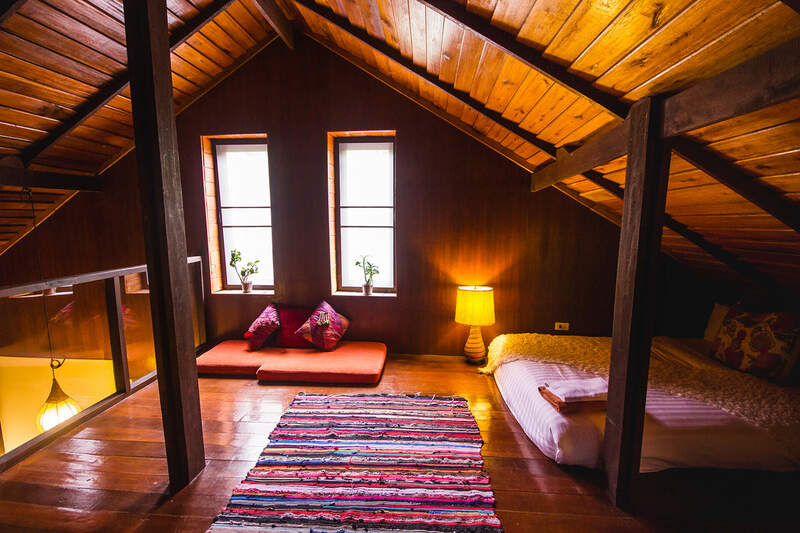 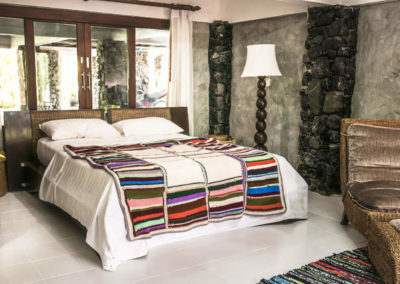 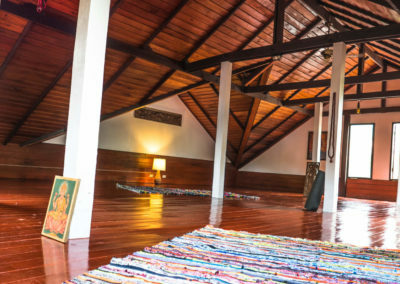 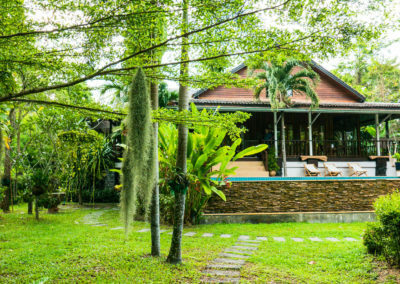 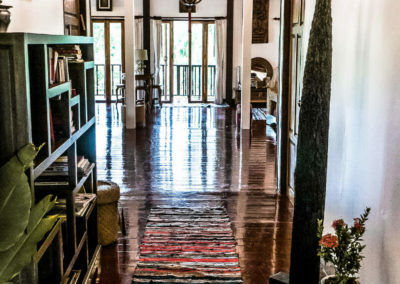 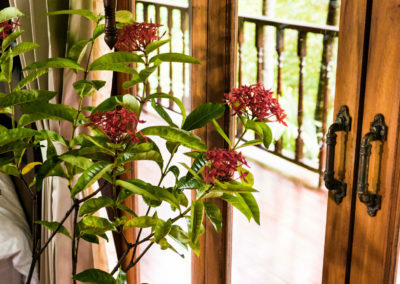 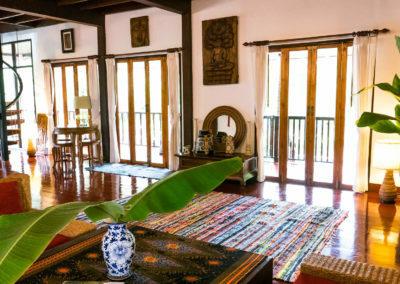 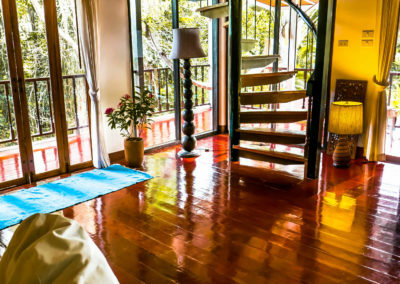 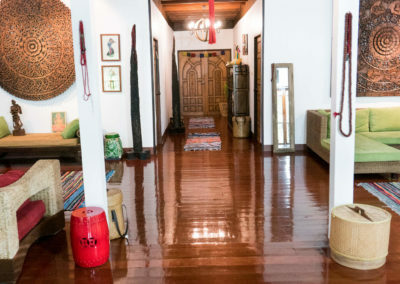 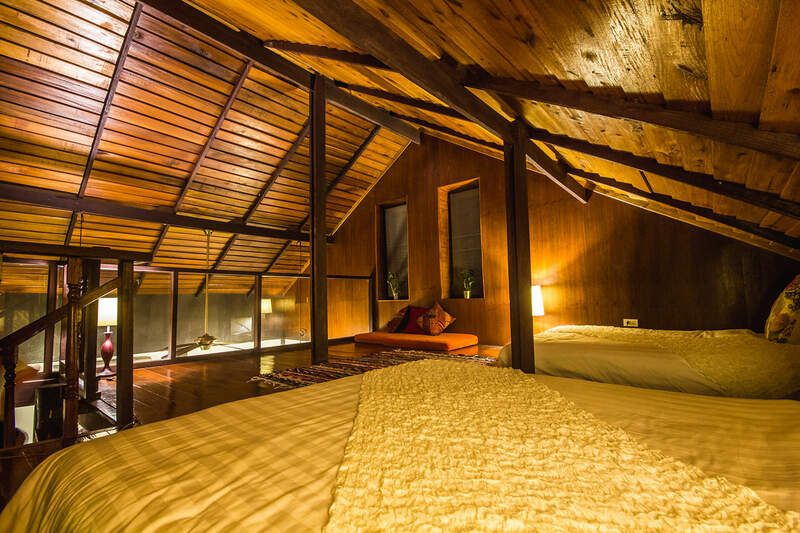 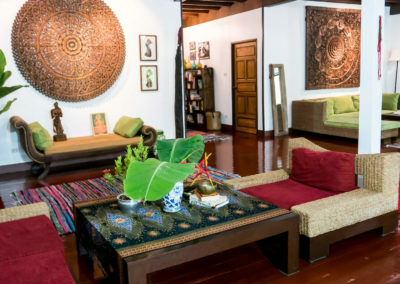 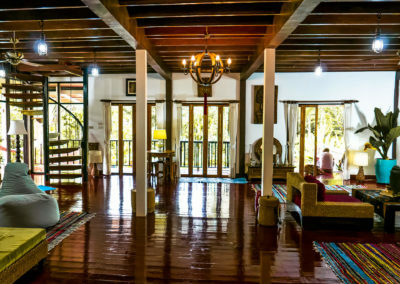 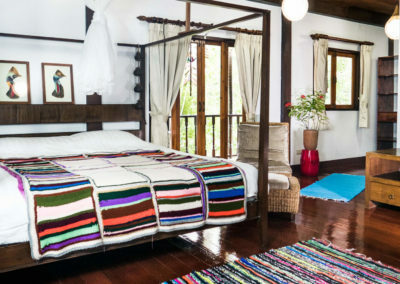 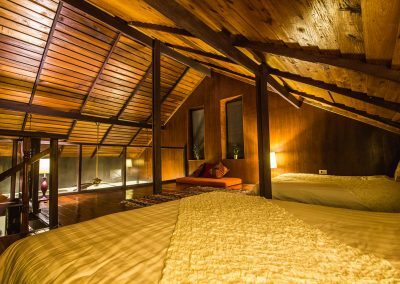 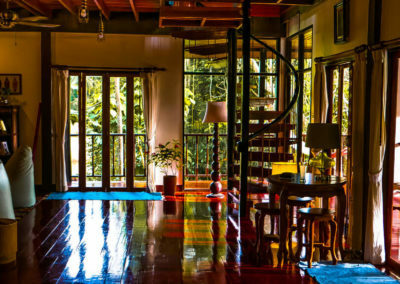 The yoga house offers a unique space that can be used for different proposes: from Special private vacation to organized group conducting a retreat. 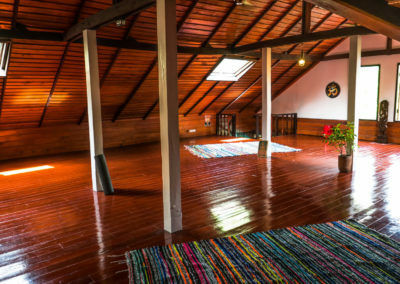 We provide a few options for using this special venue to match your specific needs and requirements: you can rent the space and use the facilities for your convenience or you can also let us customize and organize activities for you according to your preferences: daily lessons, specific workshops to an entire retreat. 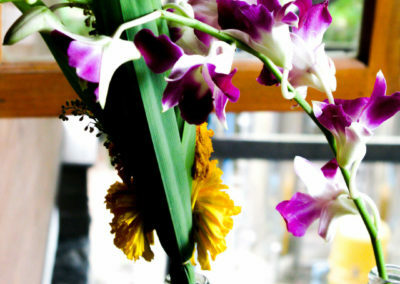 Is There something we did not cover, maybe a requirement that you are not sure if thats what we do? 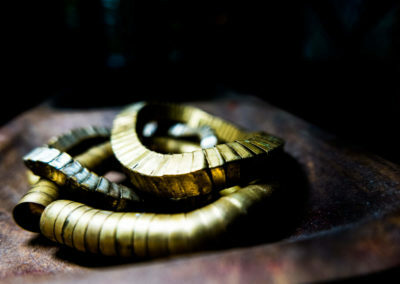 For any more details, information or questions regarding available services and prices please feel free to contact us. 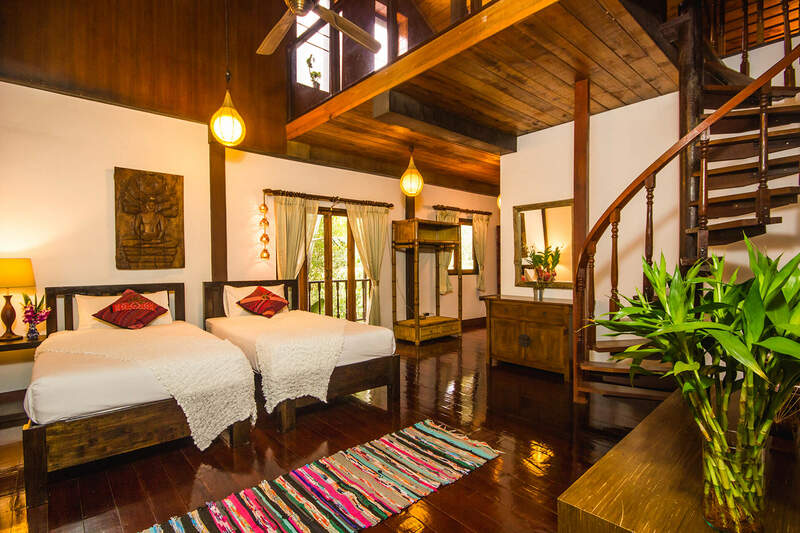 6 Bedrooms - Sleeps up to 14! 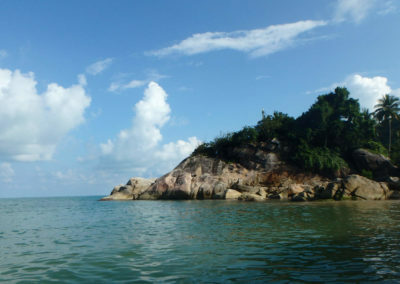 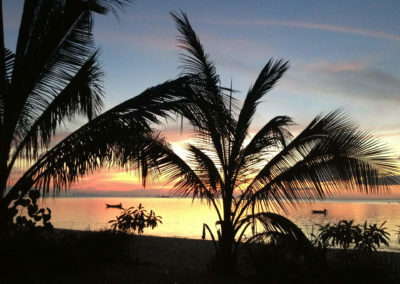 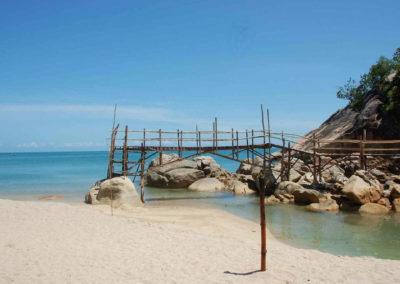 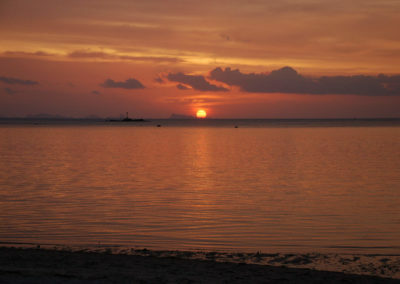 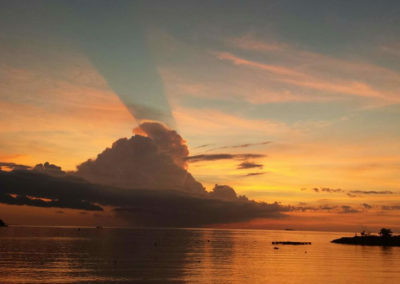 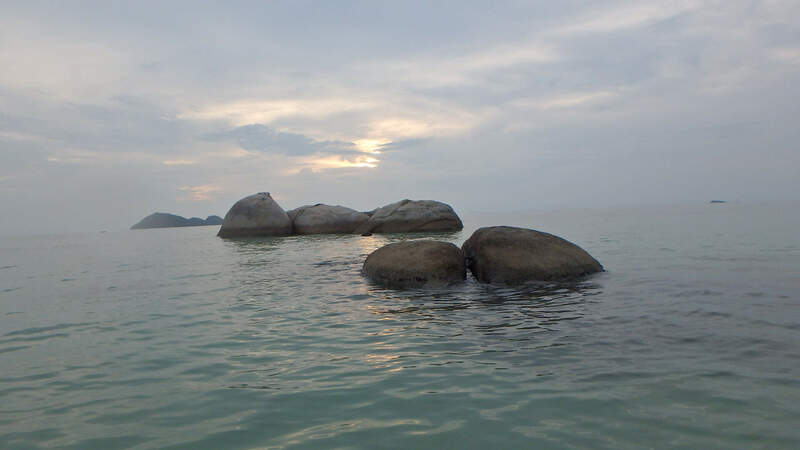 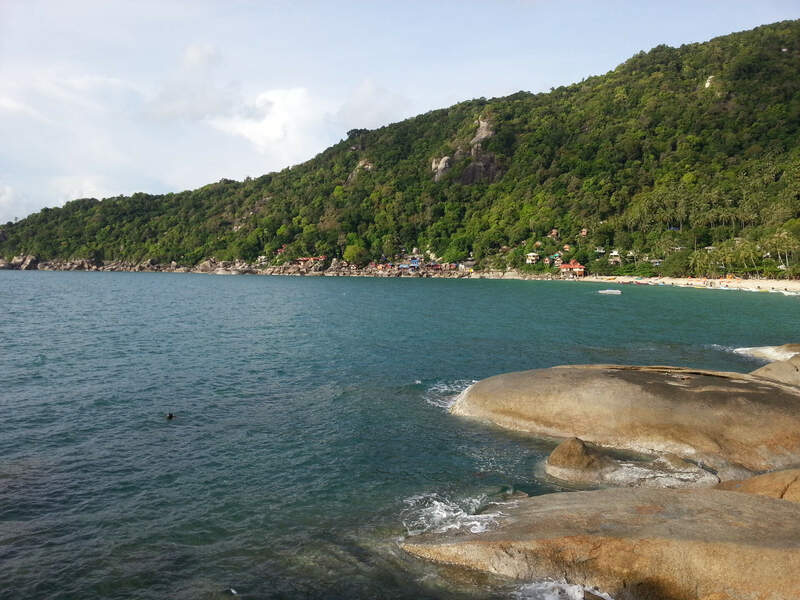 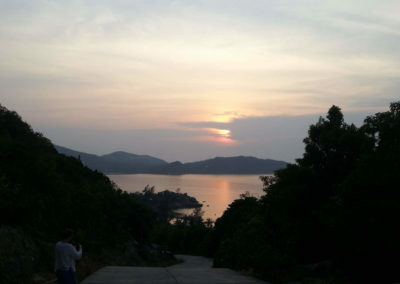 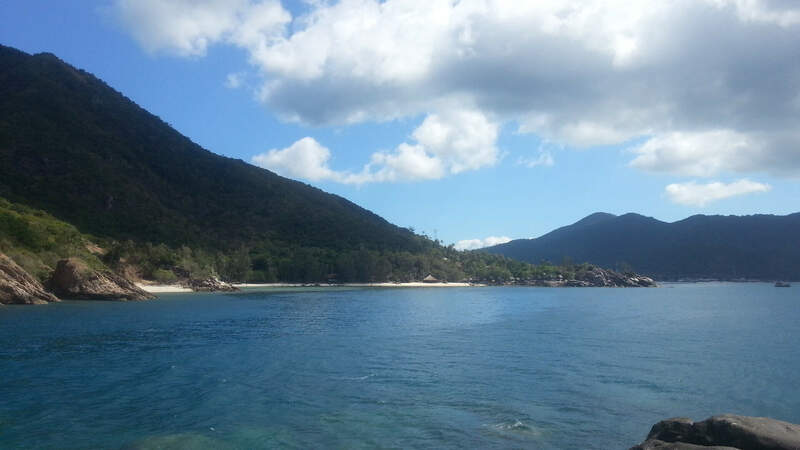 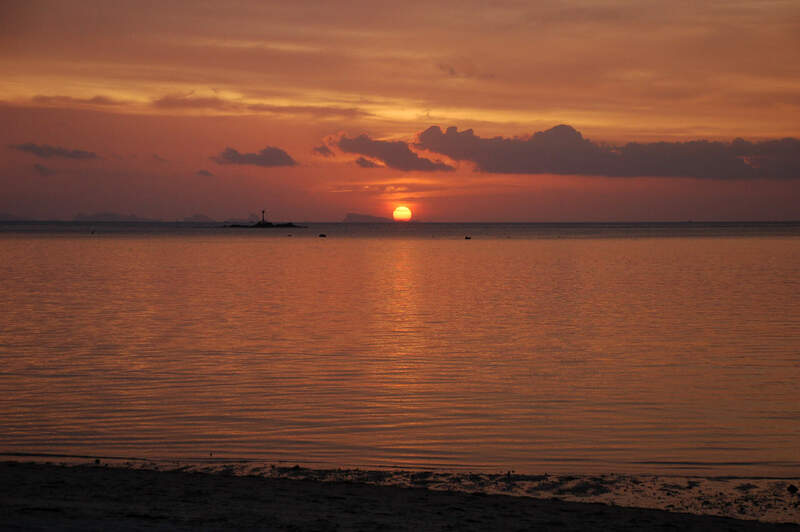 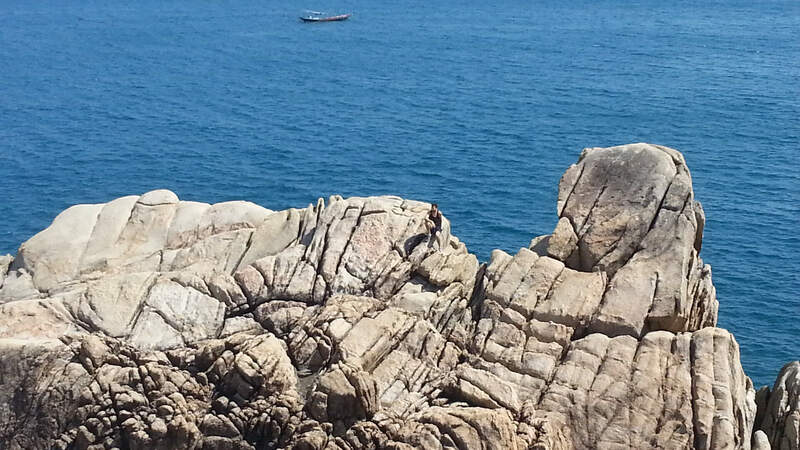 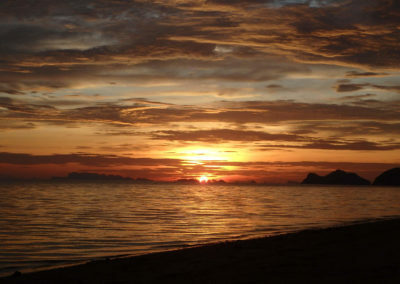 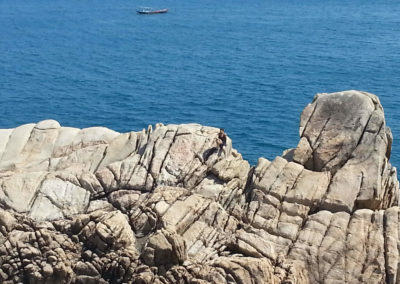 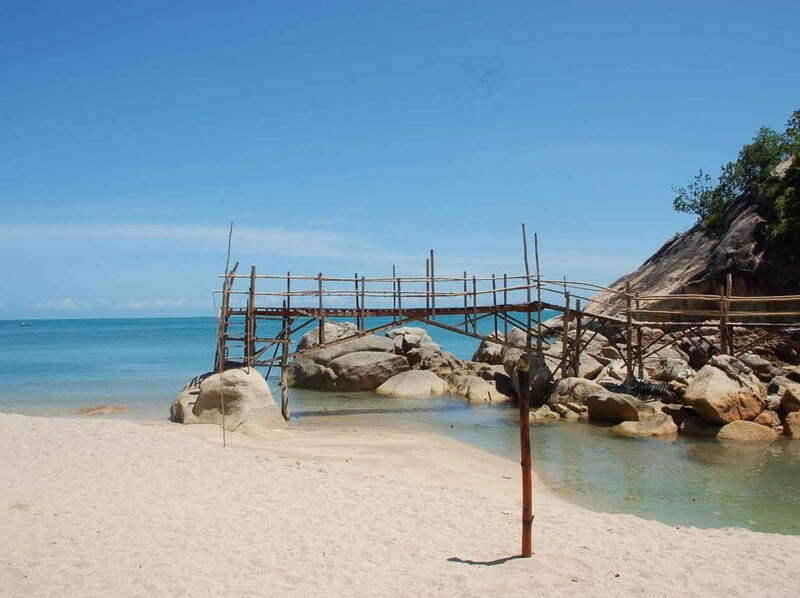 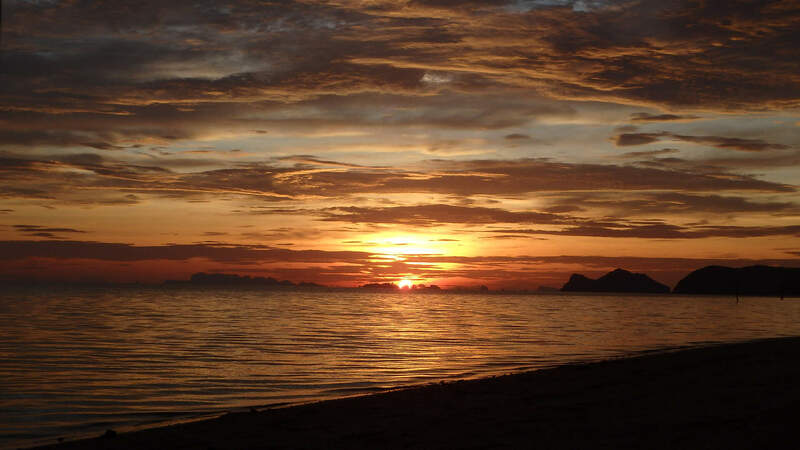 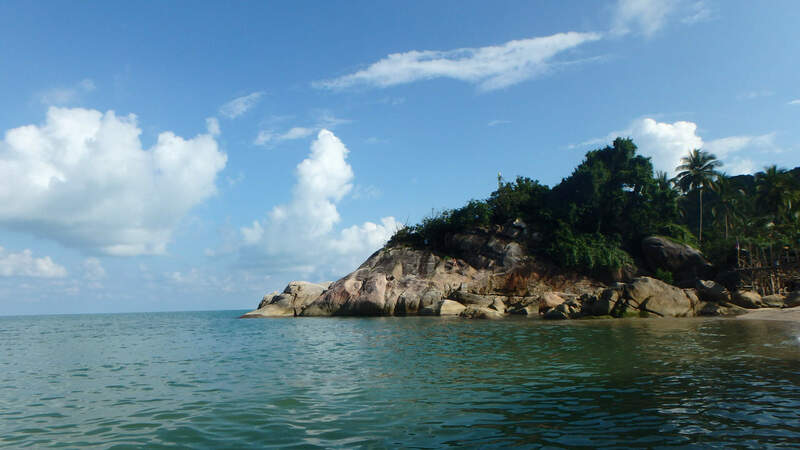 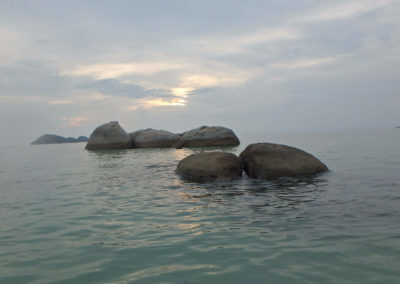 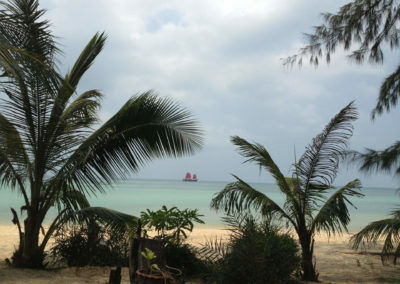 Located in south east of the country, at the gulf of Thailand, Koh Phangan is a magical island of freedom and serenity. 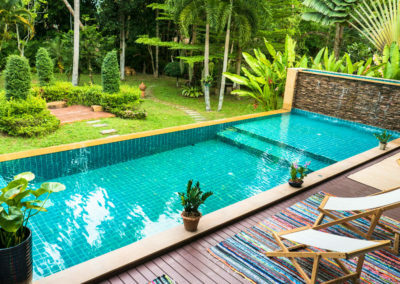 It is the perfect place to stop everything for a brief moment and dive into a reality totally different from what you are used to. 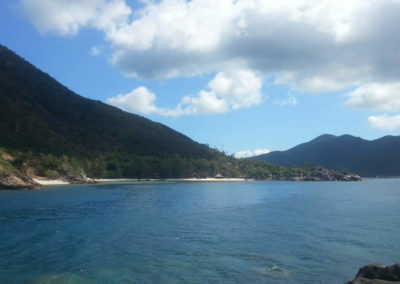 Wild nature, beautiful unspoiled beaches, simple and loving people, free and liberated atmosphere and a strong feeling of where was I all this time. 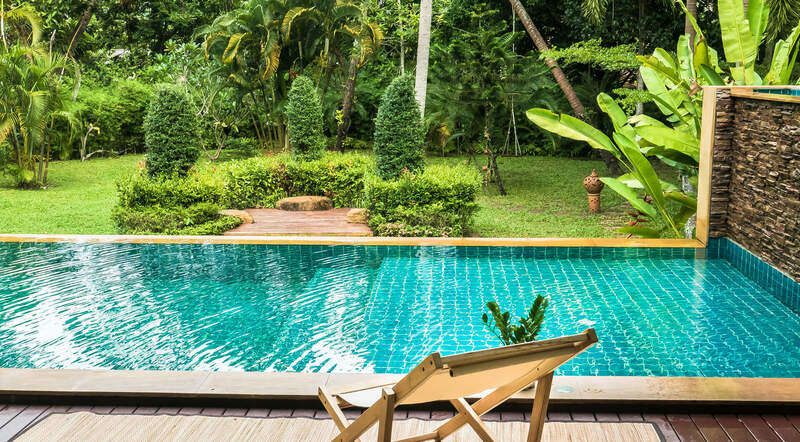 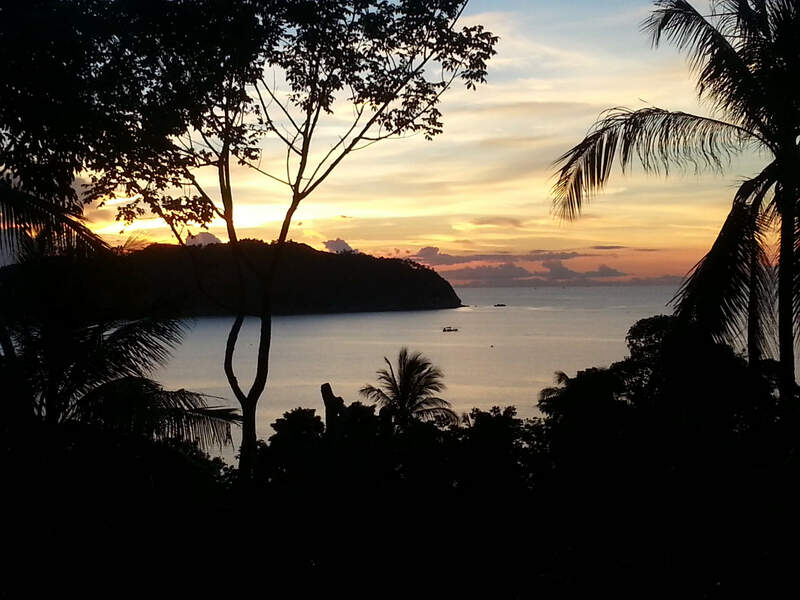 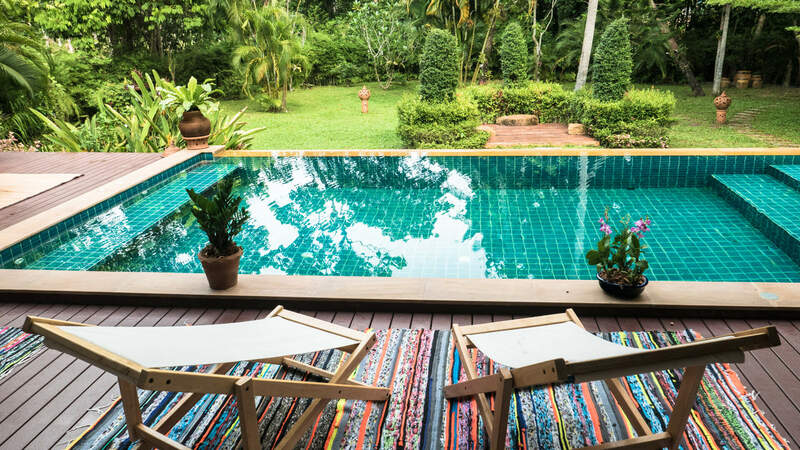 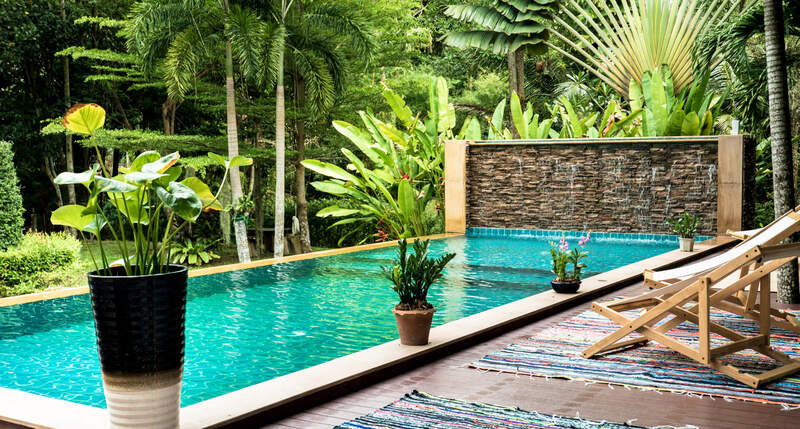 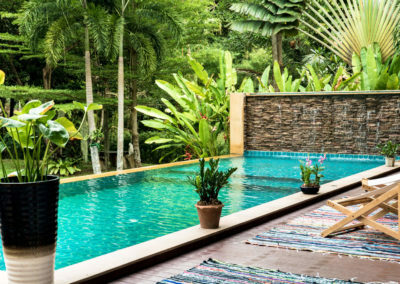 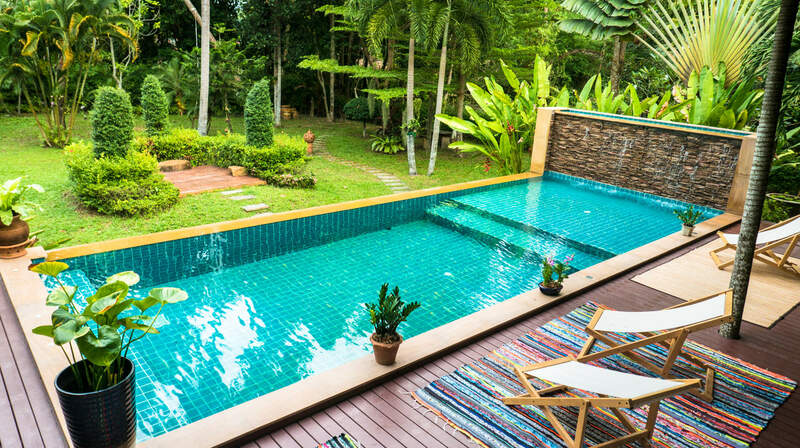 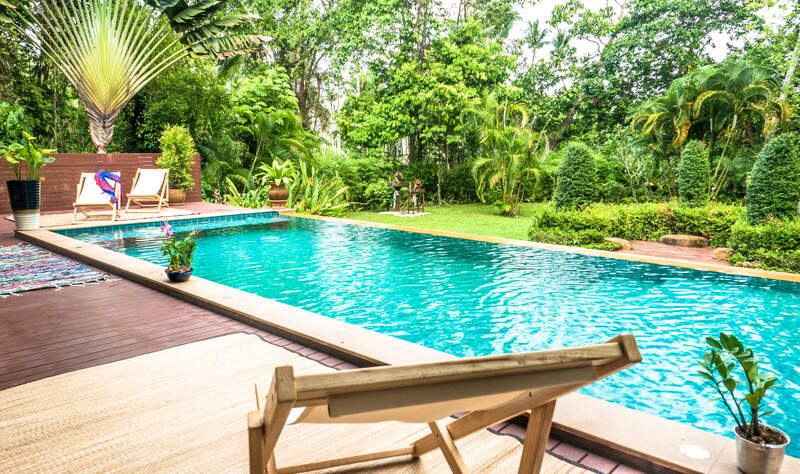 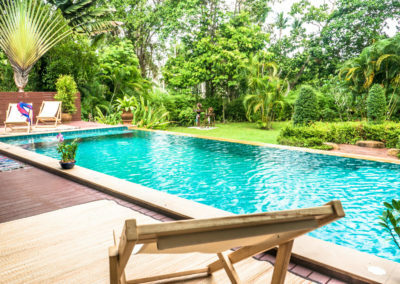 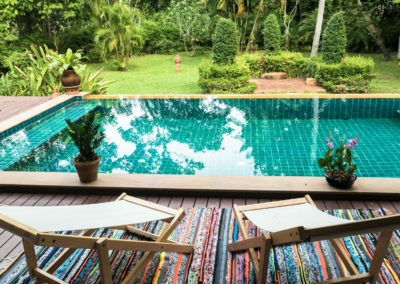 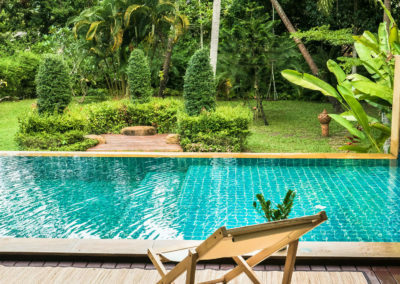 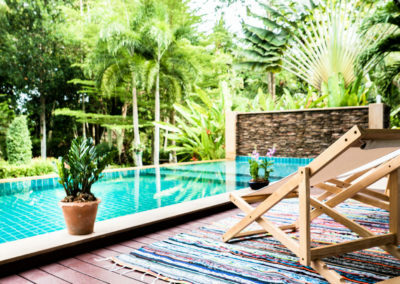 You can find everything you really need here: beautiful diving sites, great authentic Thai food, wild crazy parties and advanced yoga and retreat centres. 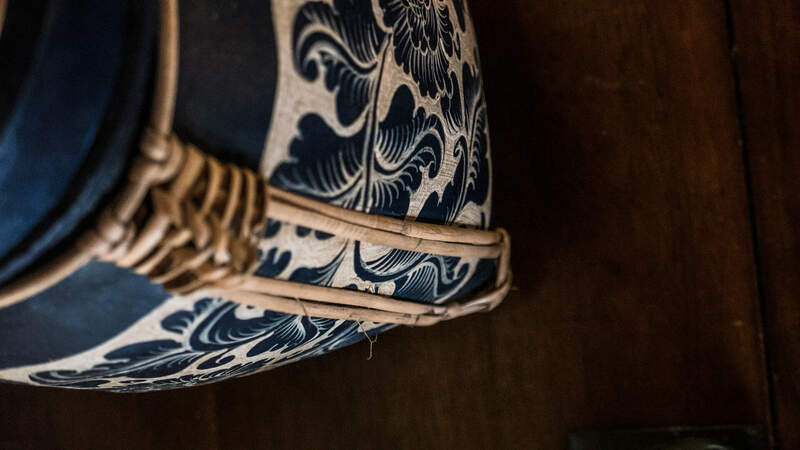 A harmonious mixture of body and soul. 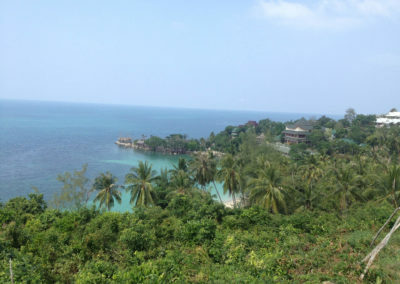 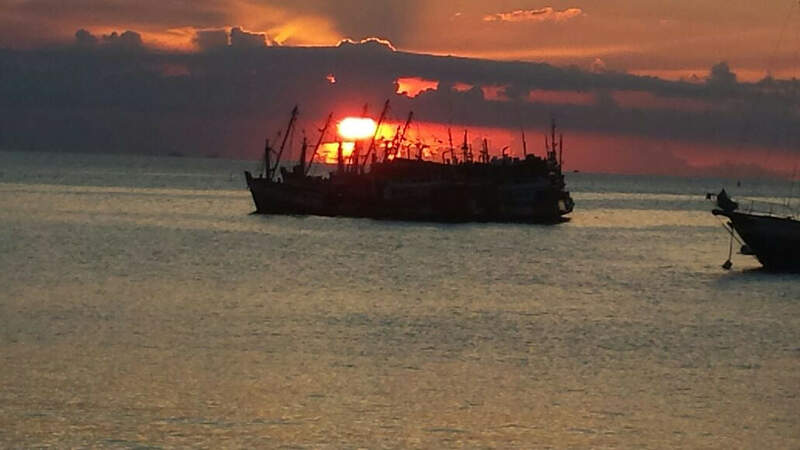 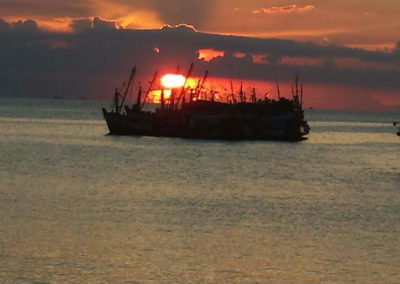 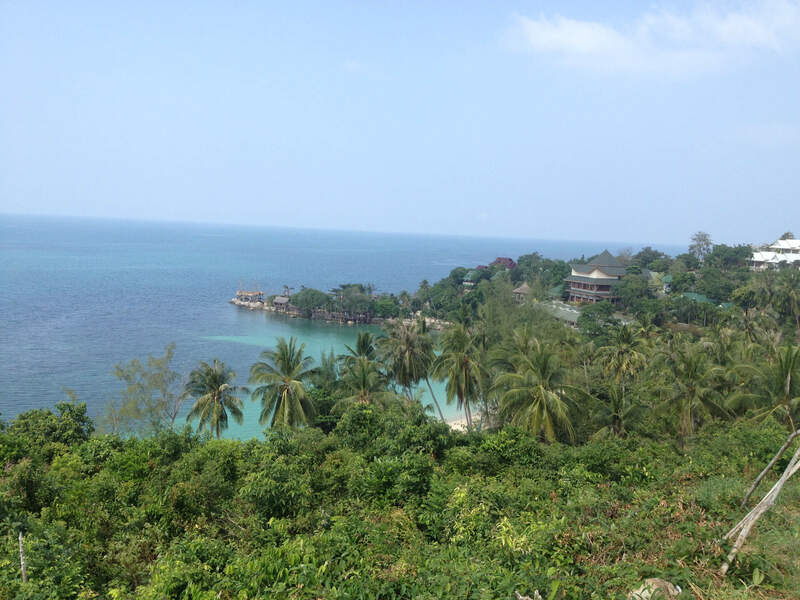 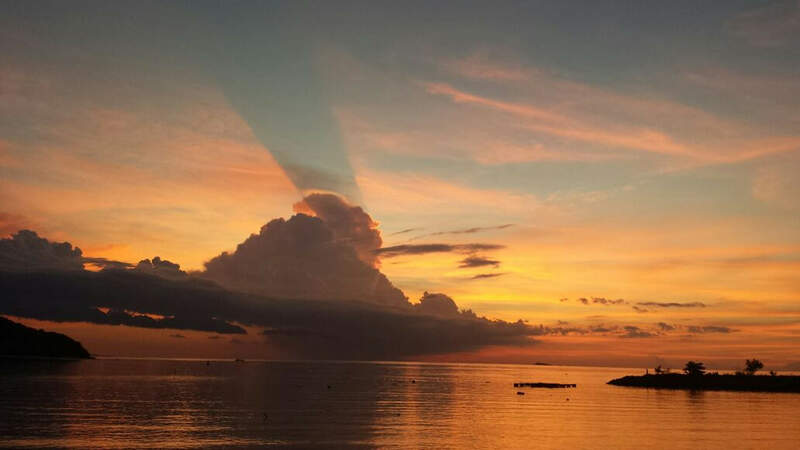 Koh Phangan is spiritual and authentic. 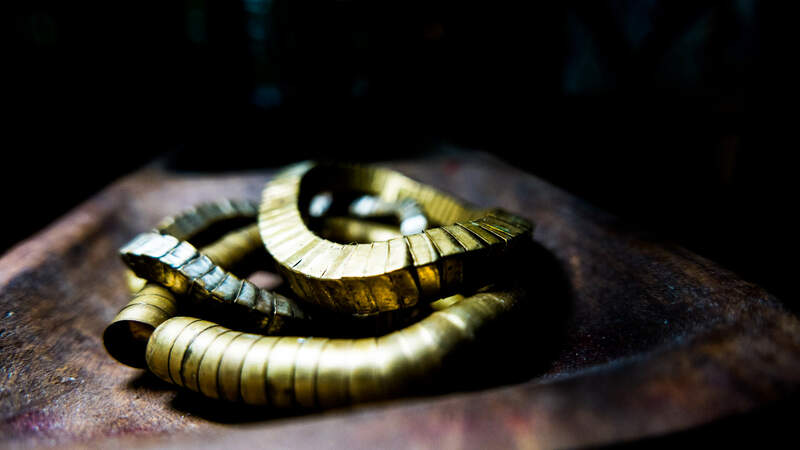 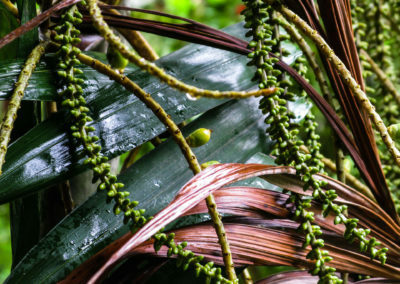 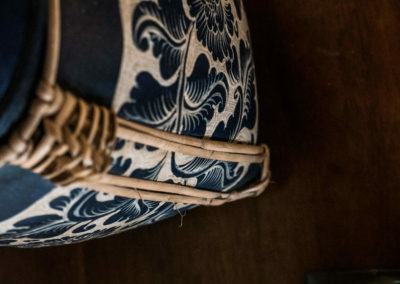 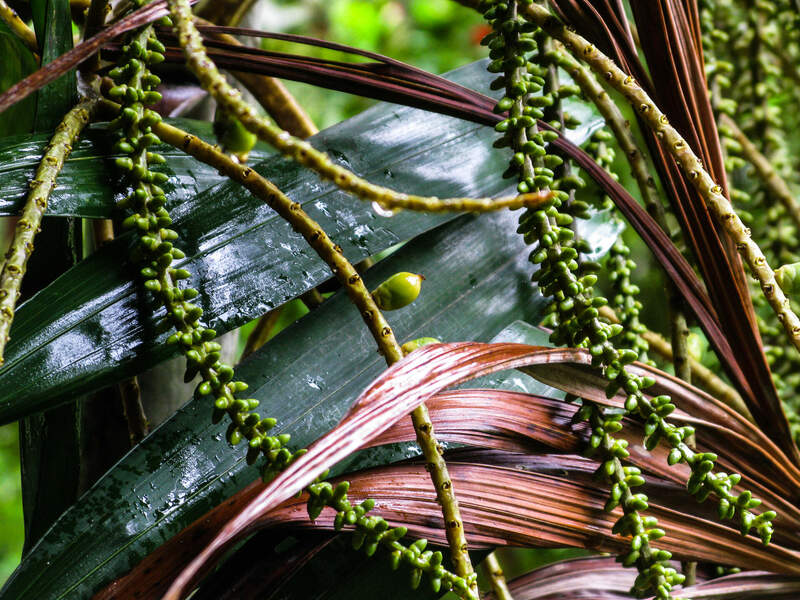 It is a place of simplicity, of fine tuning, of details that usually slips from our attention. It’s a place to reflect and be grateful for just being. 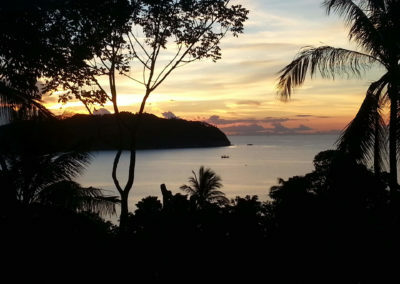 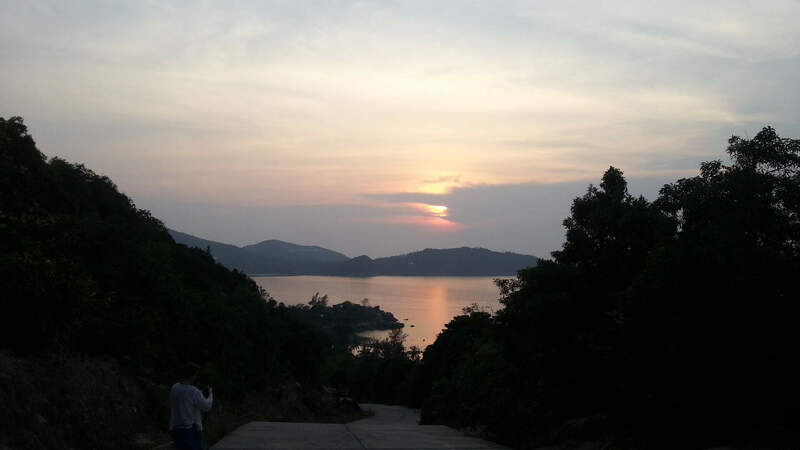 Phangan is an island of joy, an island of wonderful rides in beautiful trails on an old motorbike, profound experiences and mind blowing interactions. 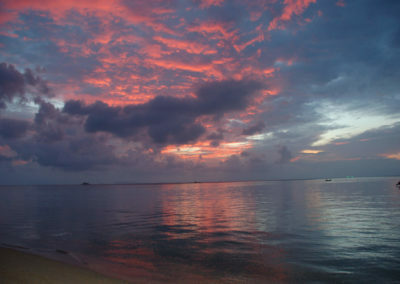 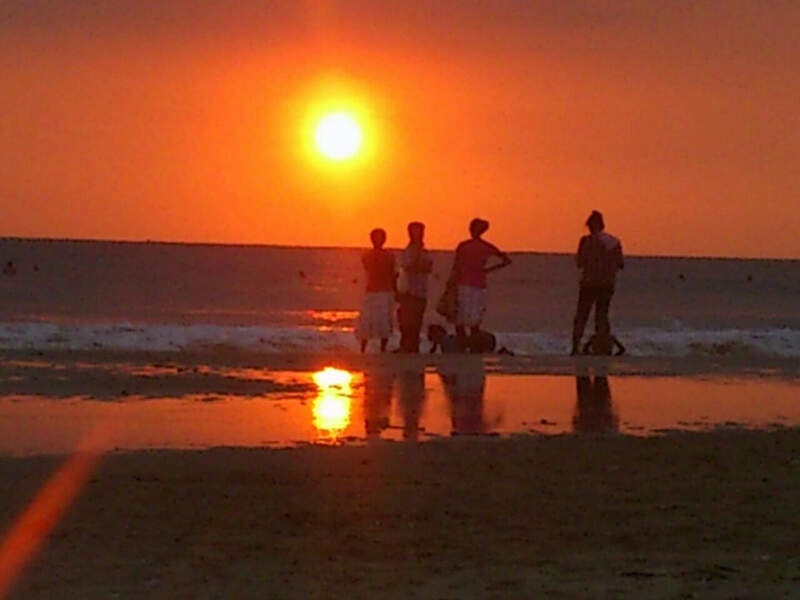 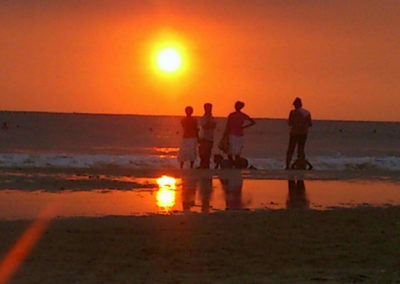 It is full of crazy amazing sunrises and stunning sunsets. 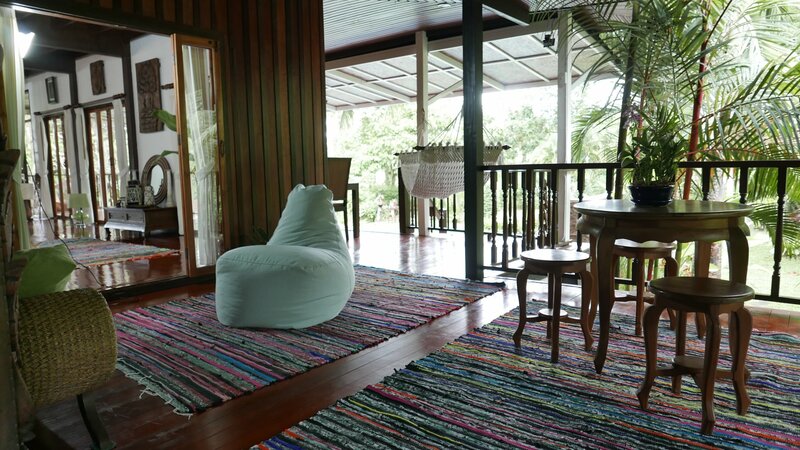 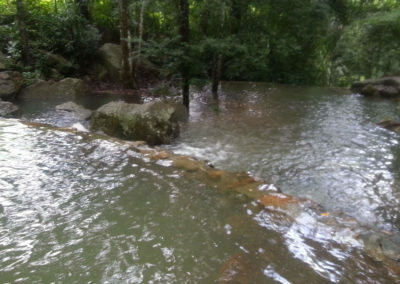 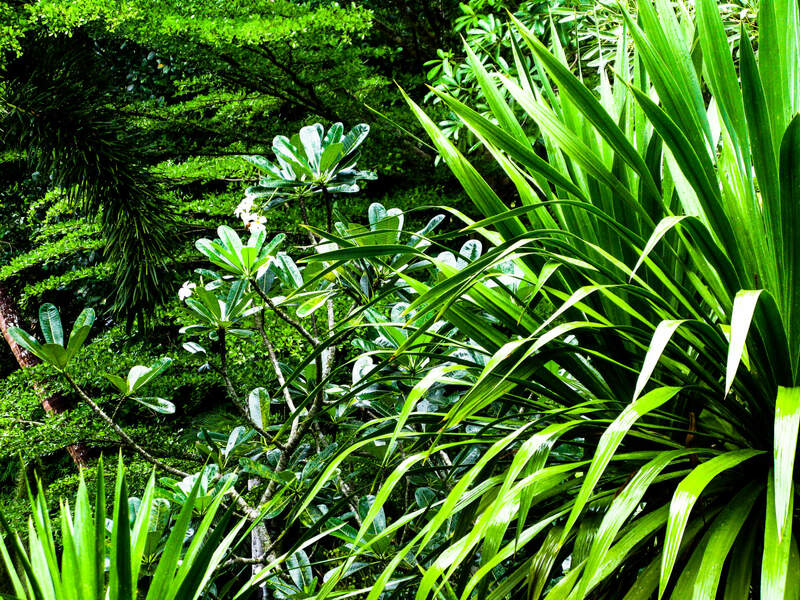 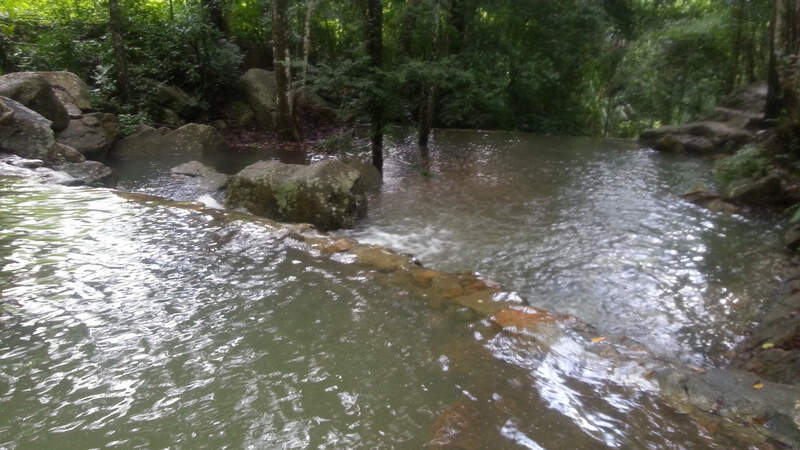 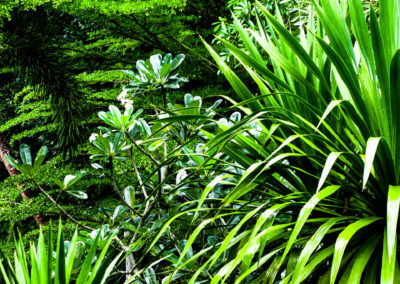 It is the perfect place to deeply relax or totally get wild. That is for you to decide. 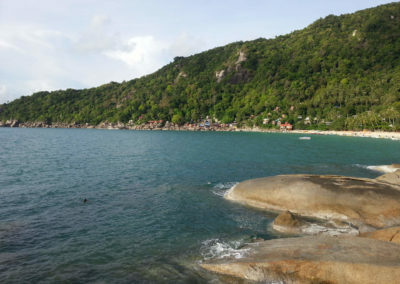 53 / 7 Moo 2 Ban Nai Suan, Koh Phangan, Surat Thani, Thailand.